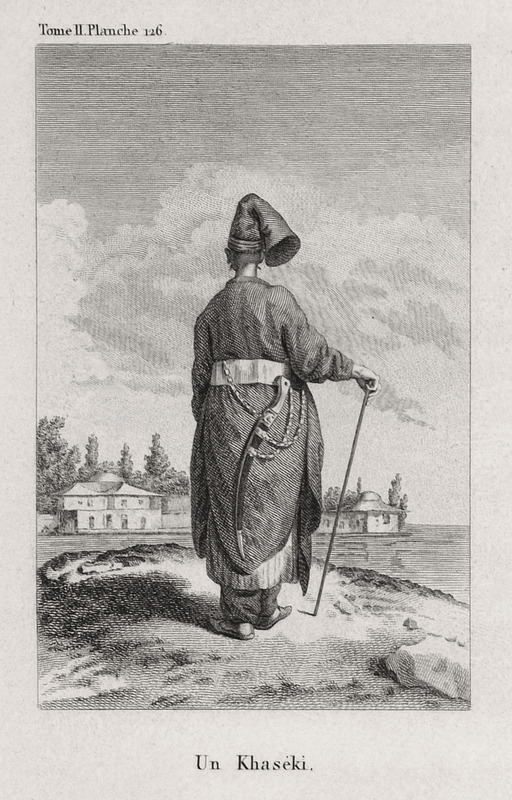 CHOISEUL-GOUFFIER, Marie Gabriel Florent Auguste de. 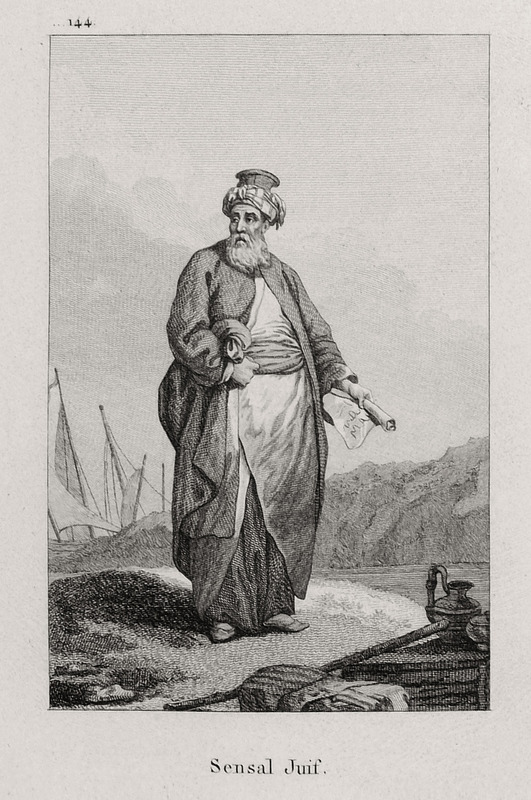 Voyage pittoresque de la Grèce. 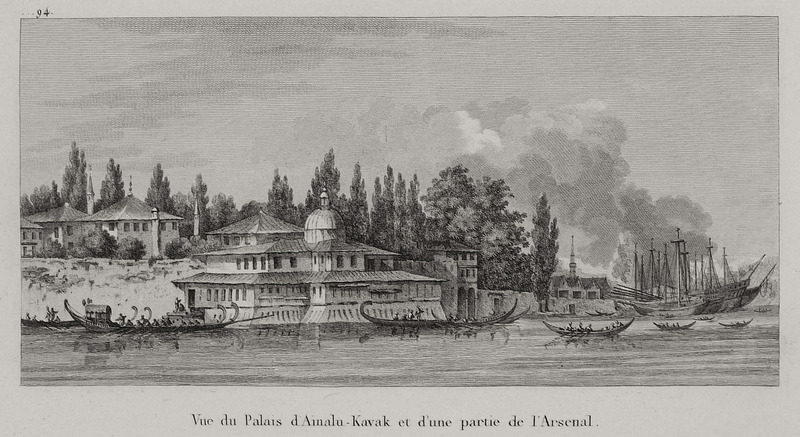 Paris, J.-J. 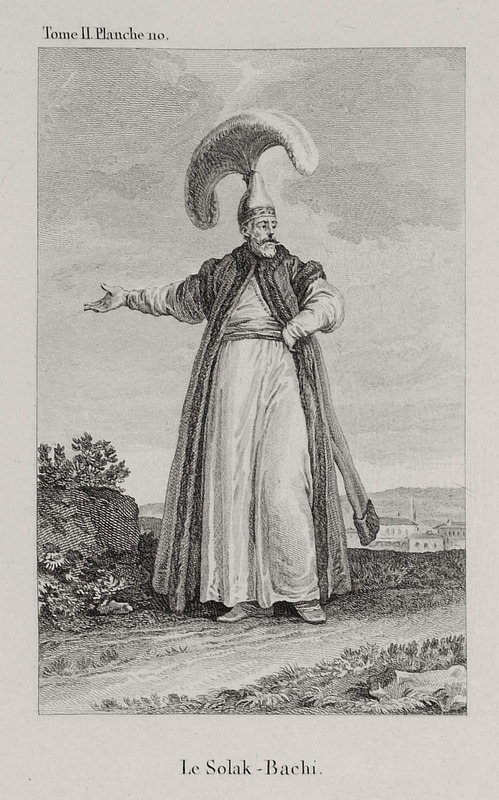 Blaise M.DCCC.XXII, [=1822]. 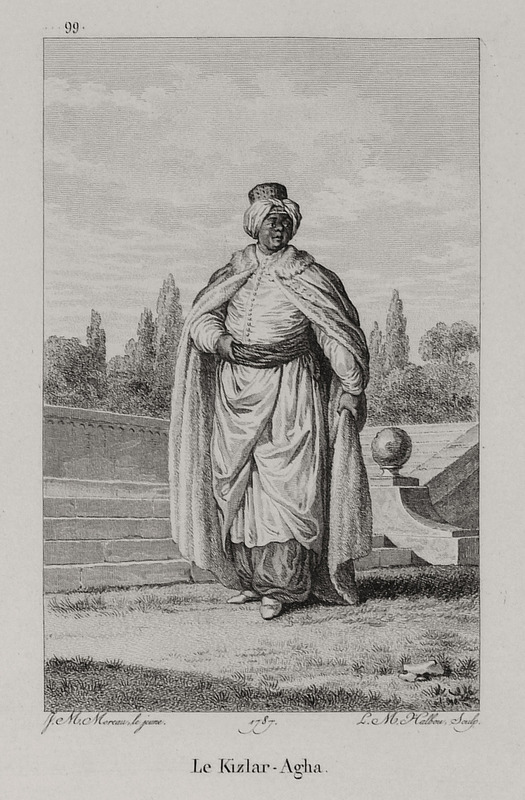 Marie-Gabriel-Florent-Auguste Comte de Choiseul-Gouffier (1752-1817) was a French nobleman, traveller and diplomat, born in Paris. 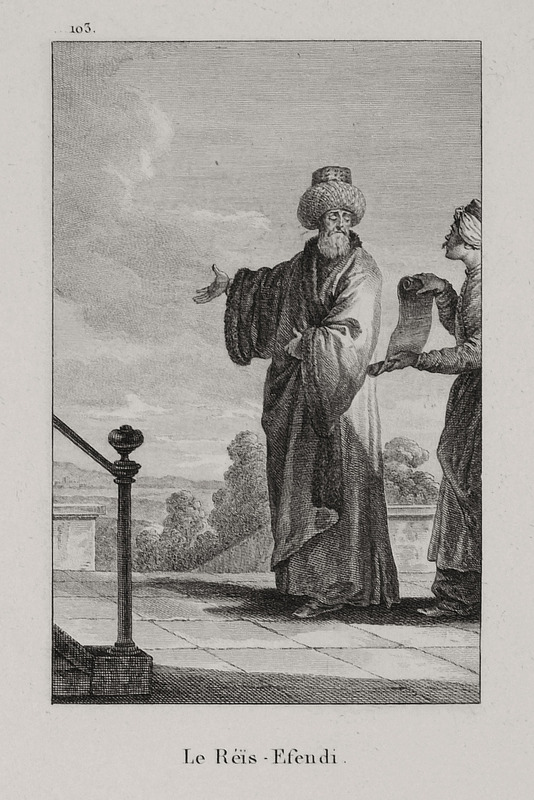 He was greatly influenced by Abbé Barthélemy, the academician and fervent admirer of ancient Greek culture, who wrote the famous historical fiction "Le Voyage du jeune Anacharsis en Grèce". 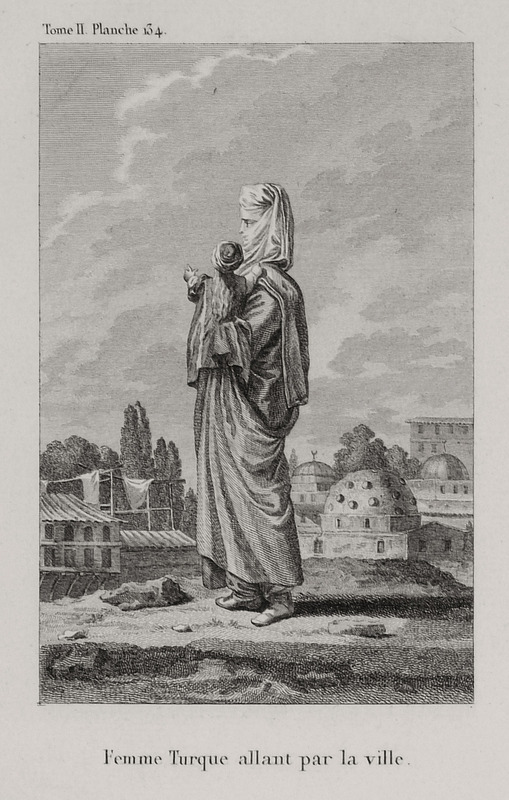 However, at the time the young count reached adulthood classical studies were highly developed in Europe and the new trend was to get to know the ancient past not only through reading the texts but also by visiting the actual historical locations. 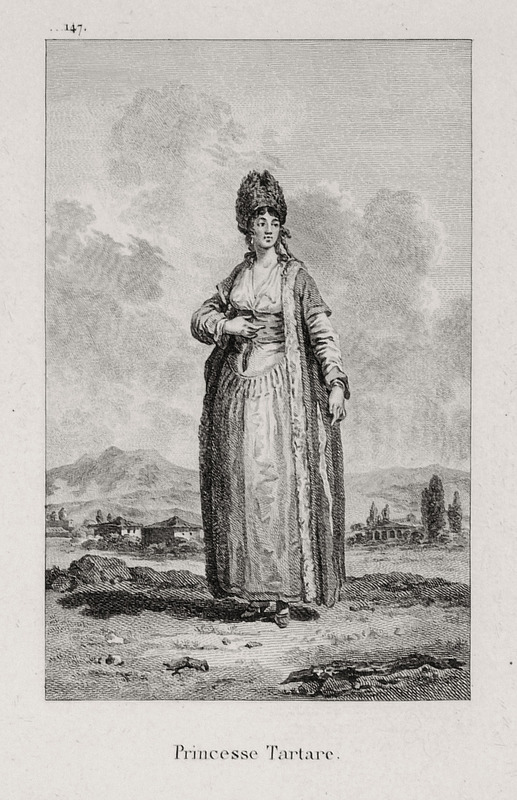 The first archaeological missions, such as the excavations in Pompeii, conducted by the Society of Dilettanti, had already been organized. 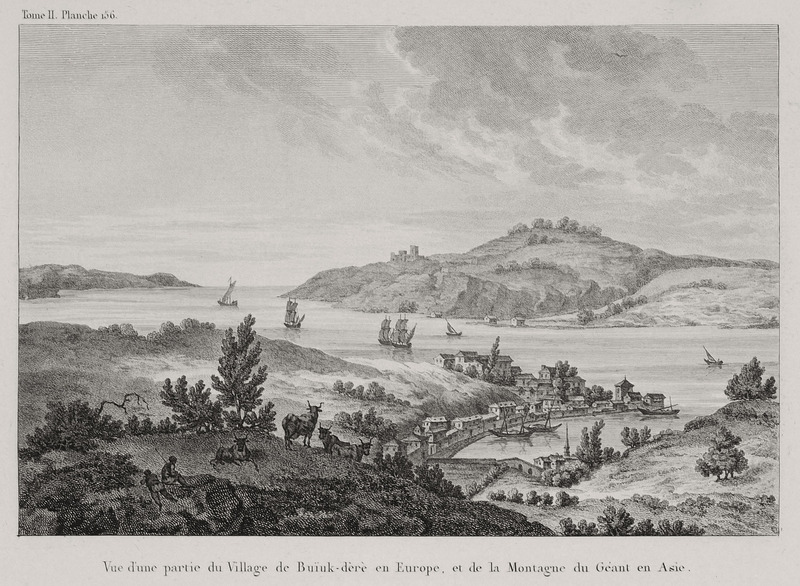 In 1776, at the age of twenty-four, Choiseul-Gouffier sailed from Toulon, aboard the frigate "Atalante", on his first voyage to Greece. 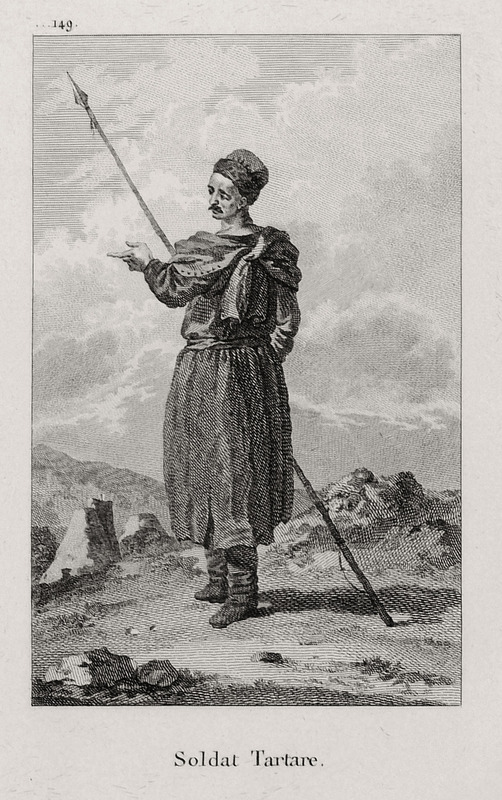 His aim was twofold, to delineate ancient monuments and to describe the modern Greeks’ way of life. 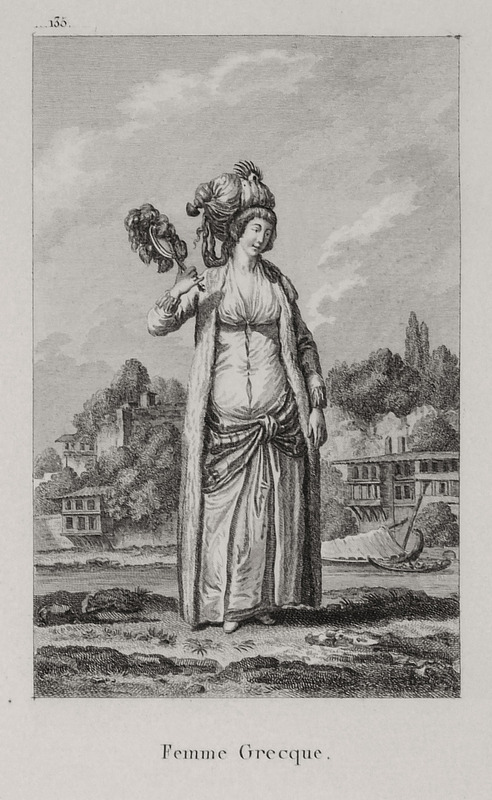 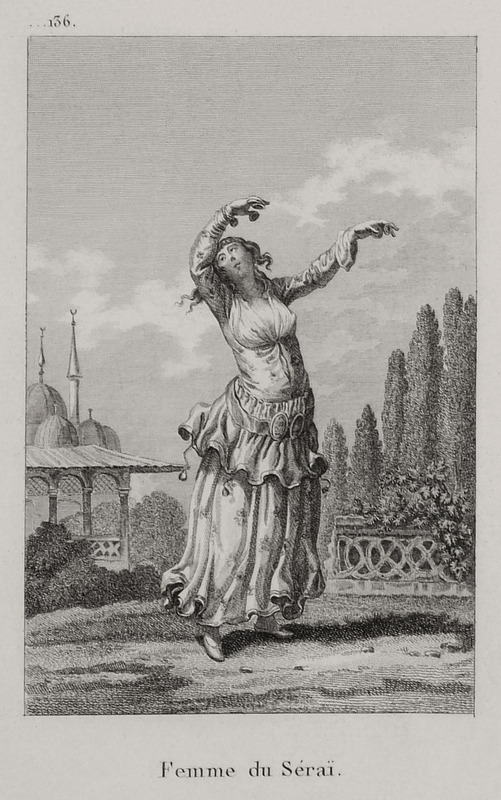 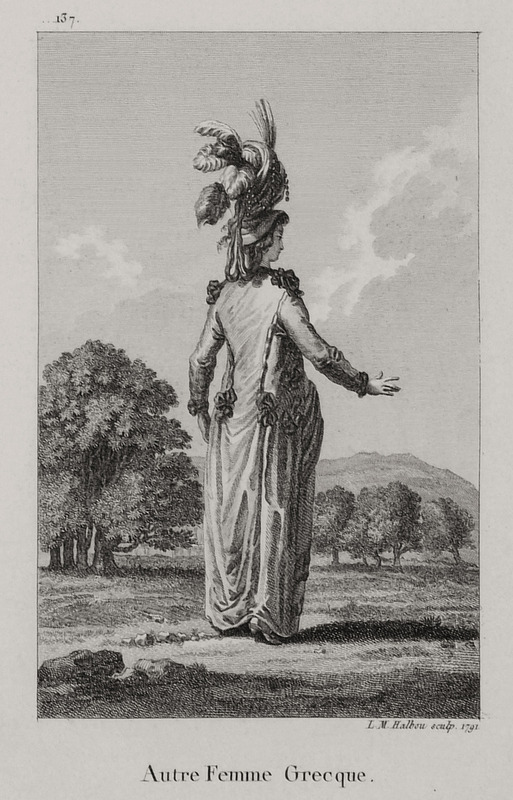 Fruit of this first year-long journey, which will be referred to below, was the publication in 1782 of the first volume of his monumental work "Voyage pittoresque de la Grèce". 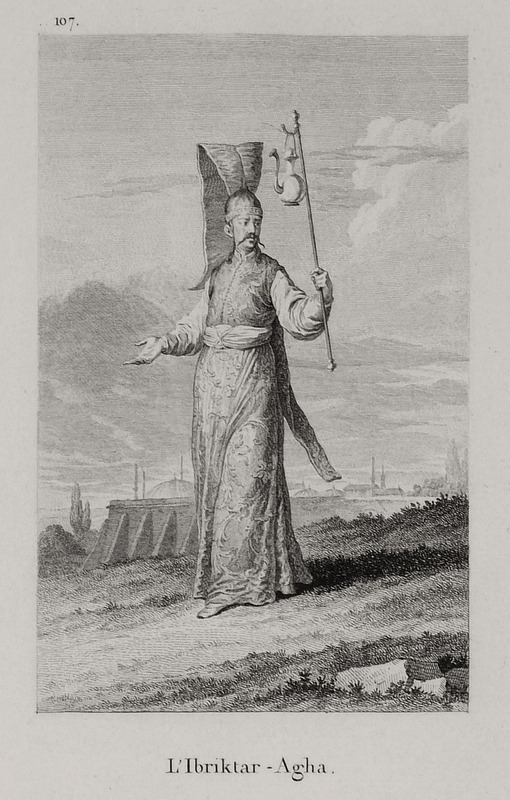 Novel feature of this "magnum opus" is that the image holds pride of place, bringing the magical world of the East alive for the European reader. 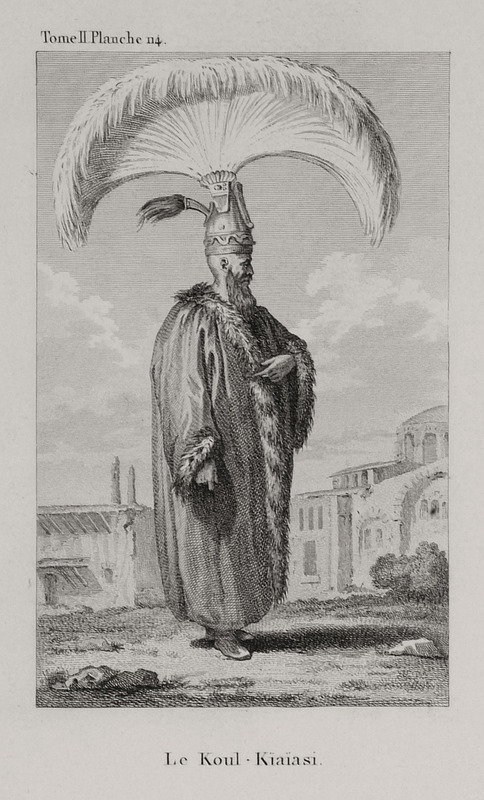 The volume includes three hundred and eleven copperplate engravings, accompanied by explanatory texts, as well as a patently philhellenic preface. 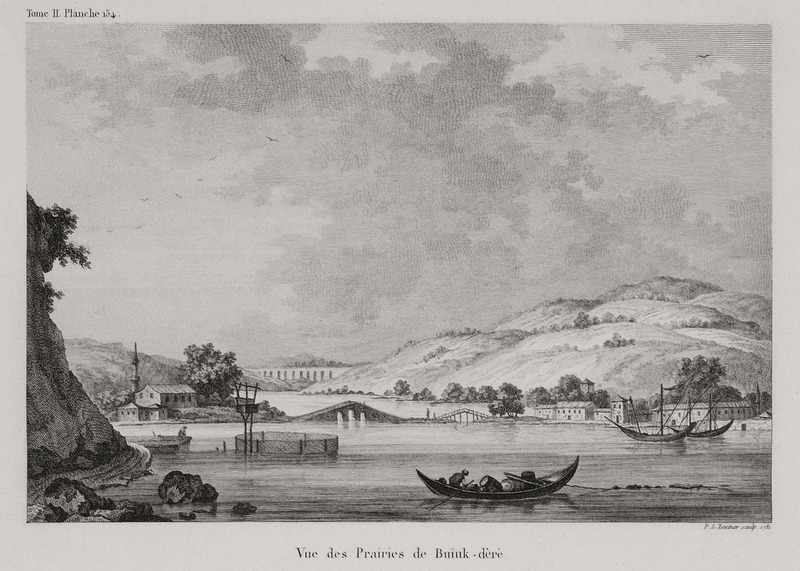 In 1784, Choiseul-Gouffier was elected a member of the Académie Française and was appointed Ambassador of France to the Sublime Porte by Louis XVI. 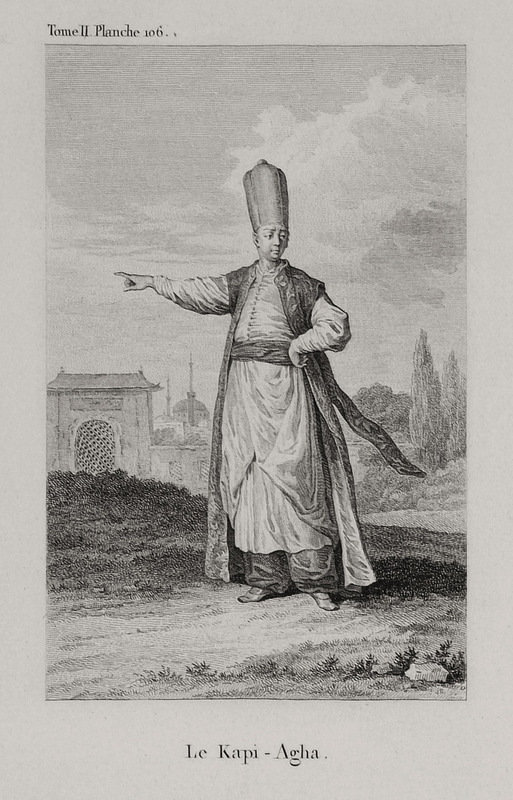 He arrived in Constantinople in July 1785, thus making a second journey to the East, this time as diplomatic envoy of the French king to the sultan. 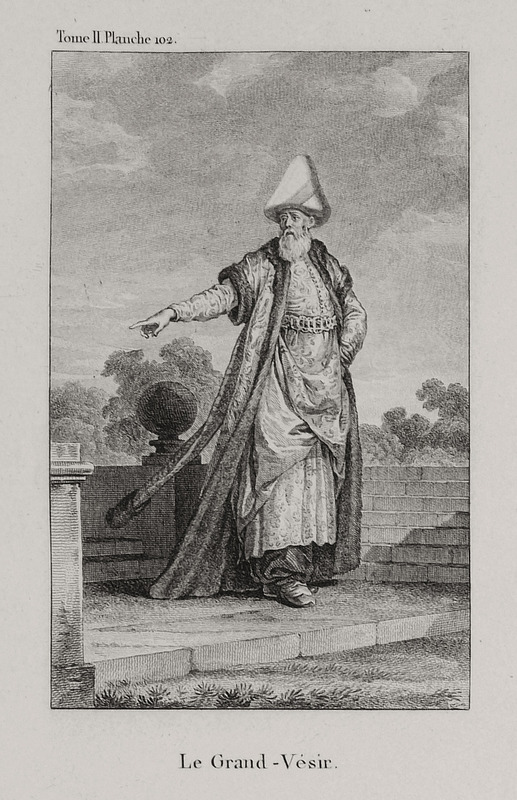 He was accompanied by a large entourage of archaeologists, painters, draftsmen, engravers, astronomers and other scientists, who carried out rigorous research in mainland Greece and the islands, which lasted several years. 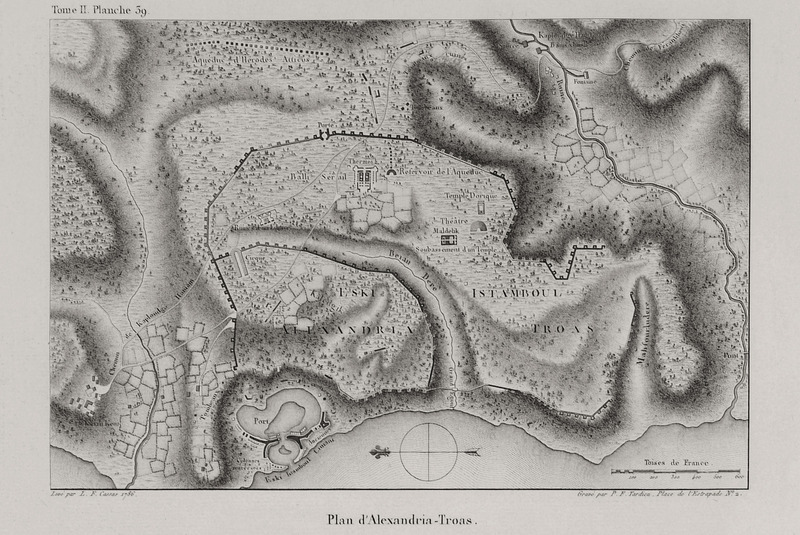 However, in his new position, as representative of France and for diplomatic reasons, he adopted a different attitude towards the Greeks. 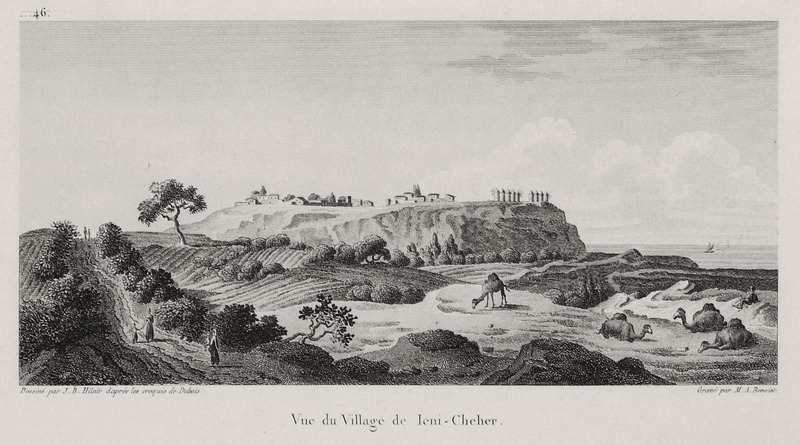 In the second year of the French Revolution, following the decision of the Convention, Louis XVI ordered the recall of Choiseul-Gouffier from the Ottoman capital and his transfer to the French embassy in London. 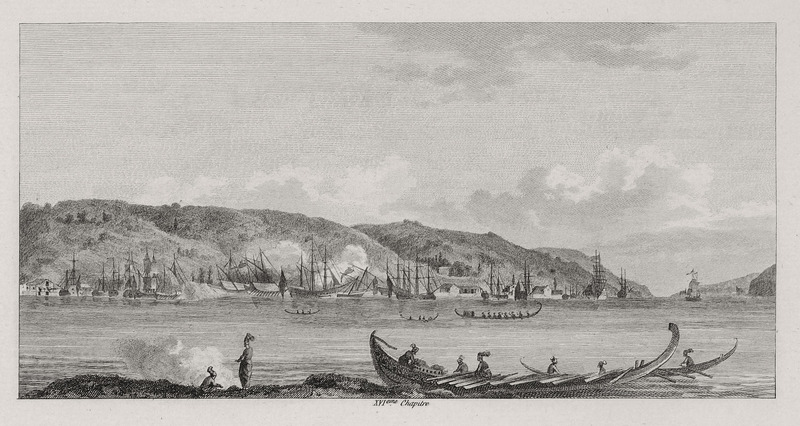 As a royalist, Choiseul-Gouffier refused to obey the order and resigned his post. 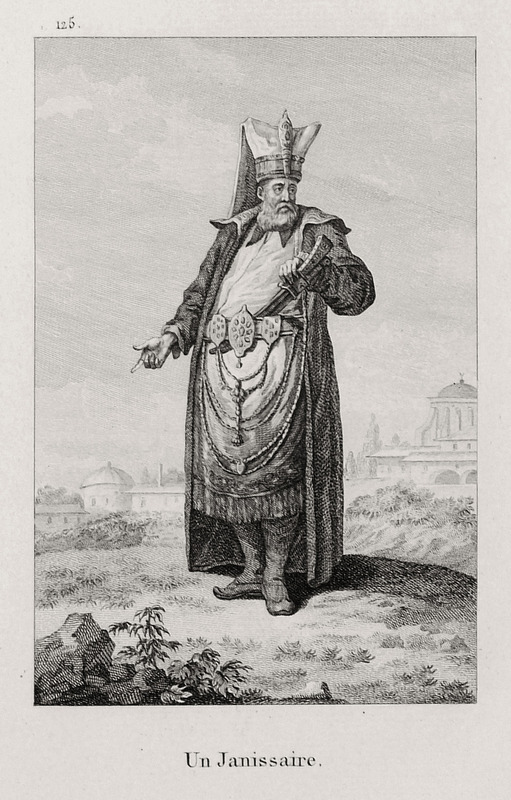 He took refuge in the court of Catherine II of Russia, where he remained for almost a decade (1793-1802), and was appointed director of the Academy of Arts and Imperial Public Library of Russia. 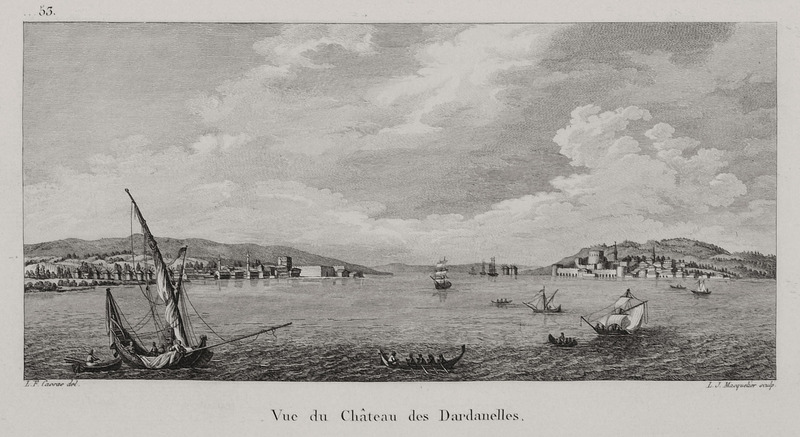 He did not return to France until after the Bourbon Restoration, when he was appointed to the office of Minister, as member of the Chamber of Peers of France. 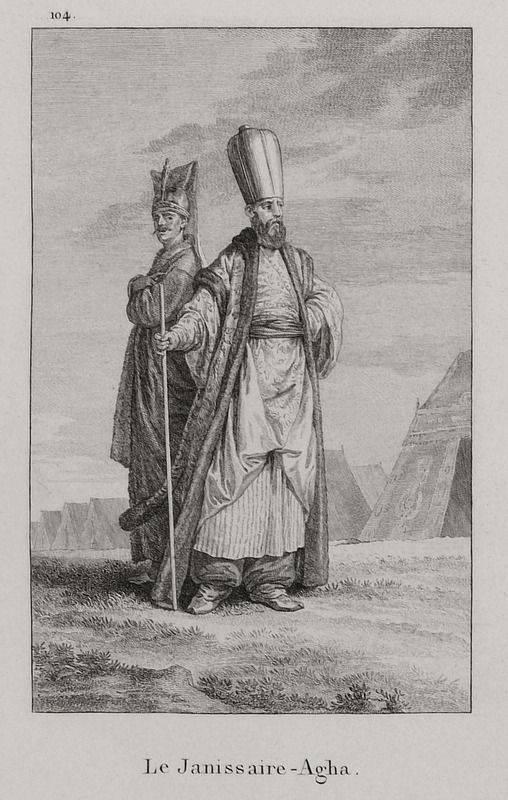 He built himself a house modelled on the Erechtheion temple, and served as president of the "Hellenoglosson Xenodocheion" (Hellenophone Hotel), a secret pre-revolutionary society. 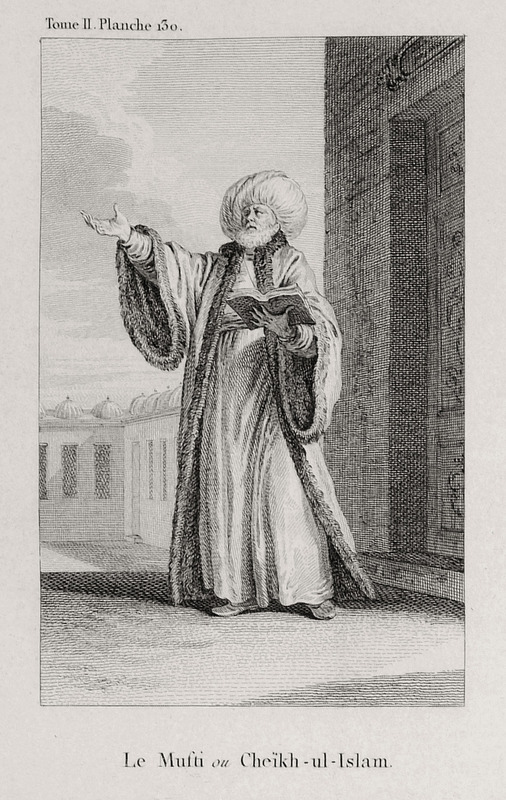 In 1809 he published the second volume of his "Voyage pittoresque ..." He died in 1817, without completing the third volume of his work, which circulated posthumously in 1822. 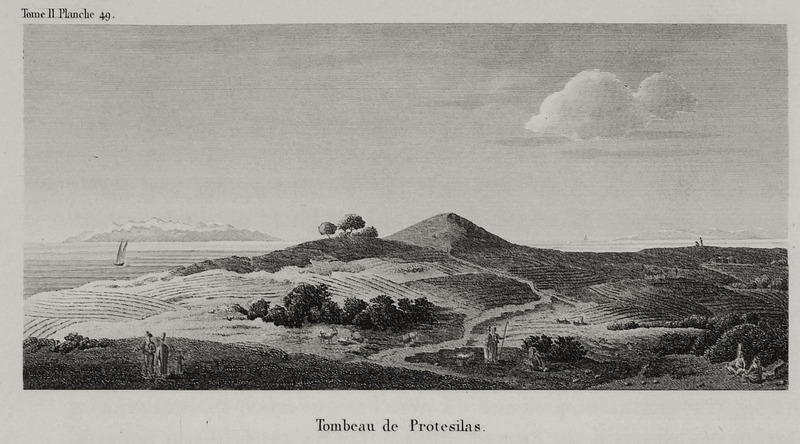 Dedicated to the topography, monuments, finds, inscriptions and coins of the Troad, this volume was edited by Barbié du Bocage and Letronne. 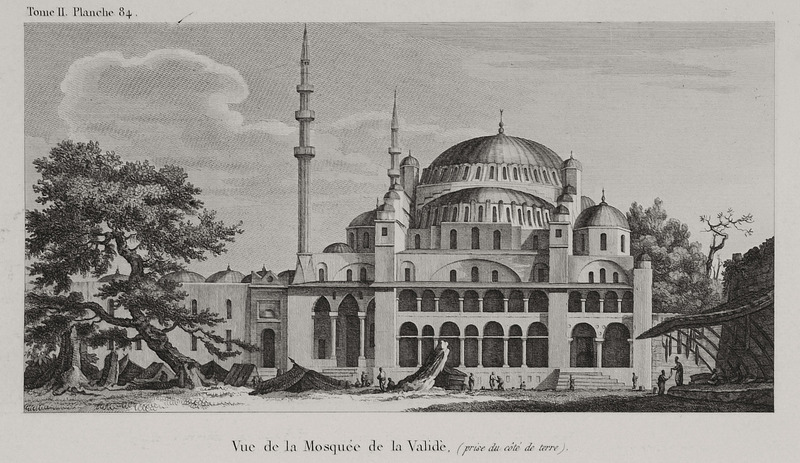 During his stay in Constantinople, Choiseul-Gouffier not only coordinated a large team of collaborators, architects, archaeologists, artists and scholars, in order to complete the delineations and drawings made during his travels, but also systematically organized several expeditions specifically for the appropriation and transportation of antiquities in large number, mainly from Athens and Attica. 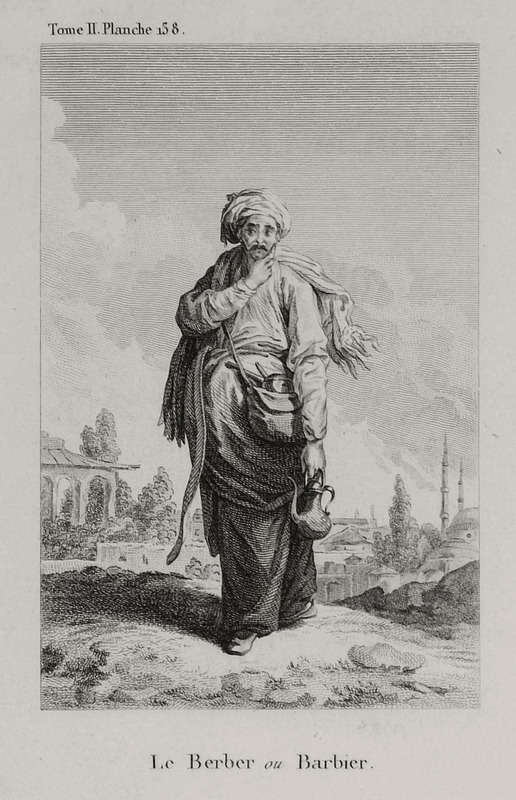 His personal collection of antiquities was sold to the Louvre and to private collectors. 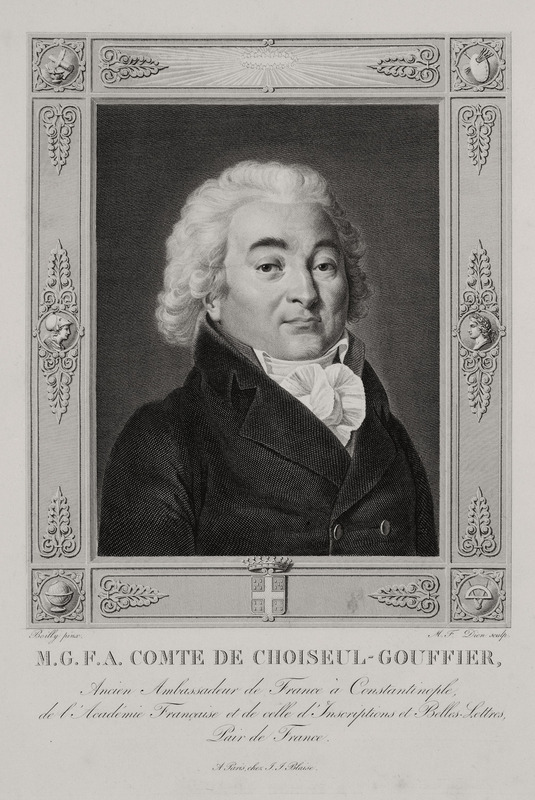 Choiseul-Gouffier is a controversial figure in contemporary research. 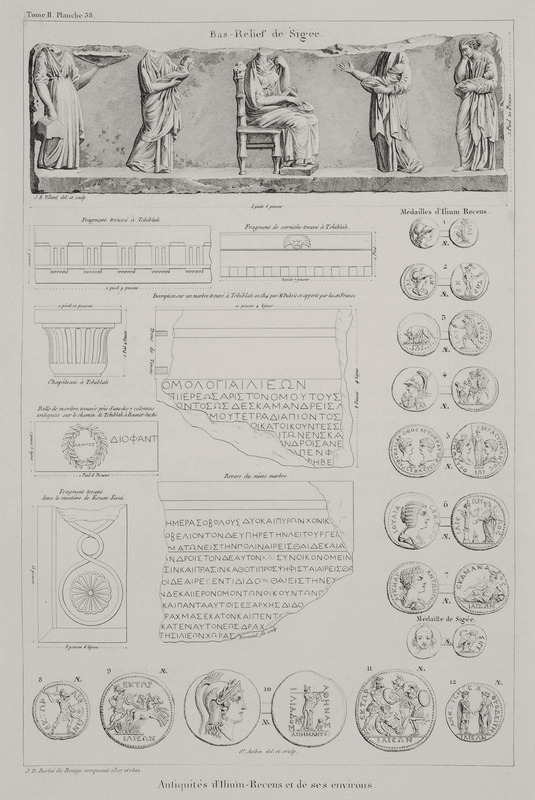 On the one hand he is considered a fervent admirer of the splendour of Classical Greece, who extols each and every feature of ancient Greek civilization. 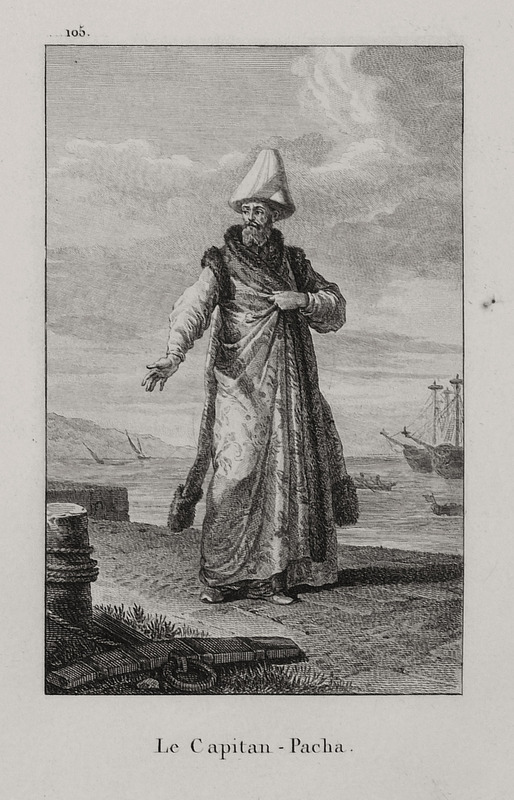 On the other, however, over the course of his political career and in order to keep the balance in diplomatic relations between the Sublime Porte, France and other powers, he gradually became a harsh critic of the modern Greeks. 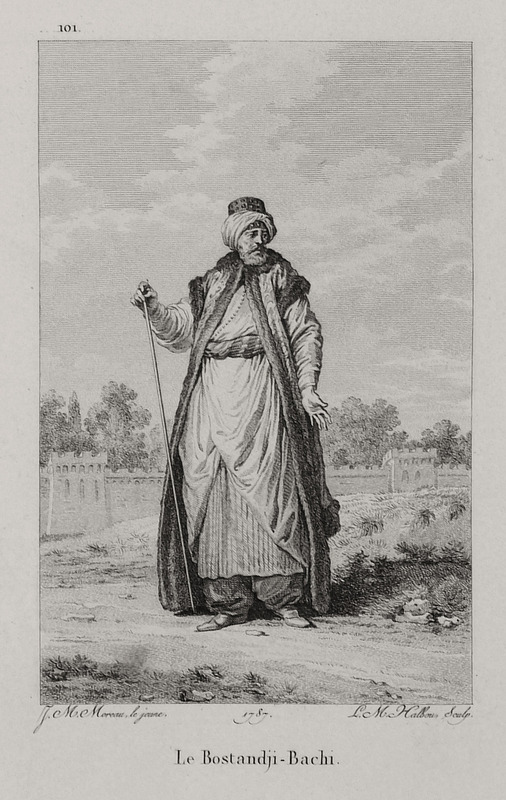 This shift in Choiseul-Gouffier’s attitude is reflected in the second edition of his work, published in 1842, after his death, where even the title has been changed to "Voyage pittoresque dans l’empire Ottoman, en Grèce...." Be that as it may, this French nobleman, an accomplished diplomat after his second voyage (1784-1792), gave to posterity a three-volume work that bespeaks a man of many talents, interested in archaeology, a curious and critical spirit with a highly developed aesthetic sensibility. 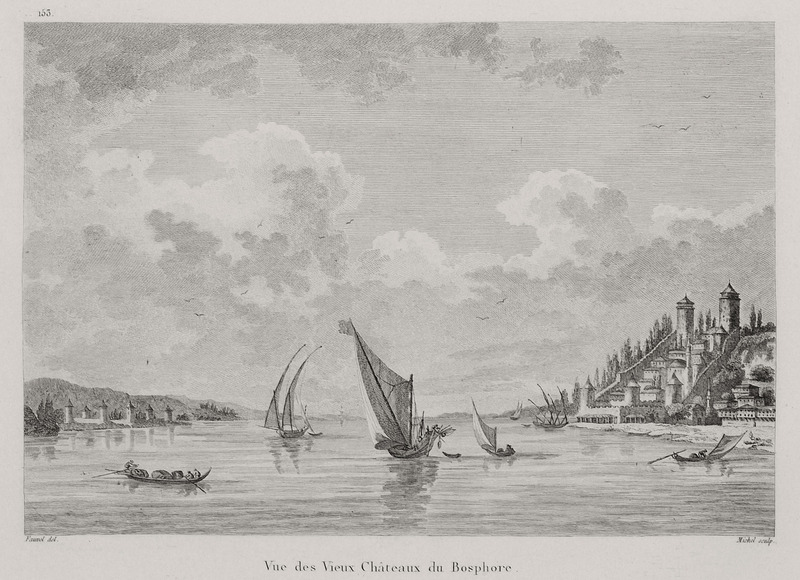 Besides being a very significant travel writer, Choiseul-Gouffier also proved to be a most capable diplomat. 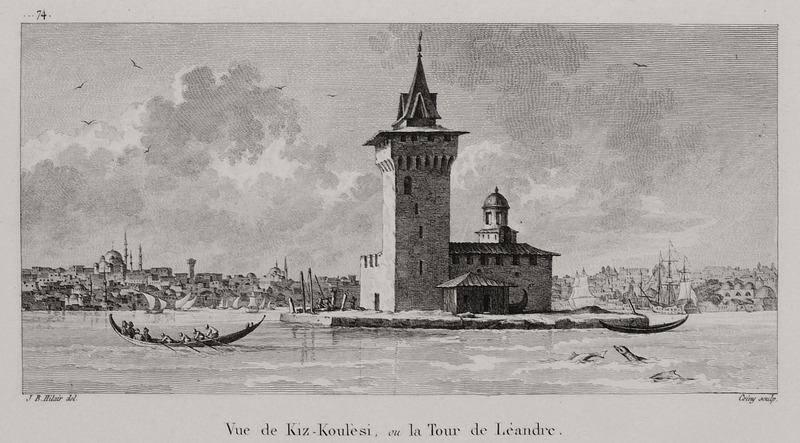 As ambassador of Louis XIV he met with success, achieving among other things, in the final years of the long friendship between France and the Ottoman Empire, the addition of ten articles to the Capitulations regulating the transit of French ships in the Black Sea. 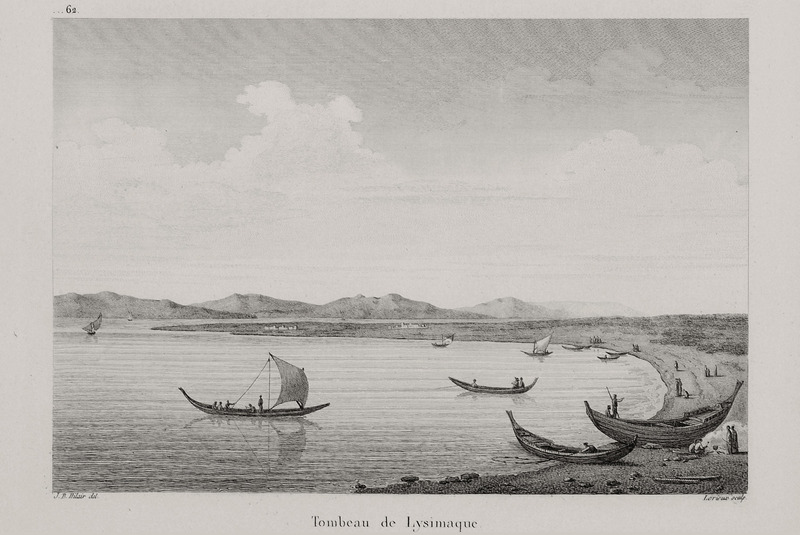 The first volume of Choiseul-Gouffier’s work describes mainly his first voyage. 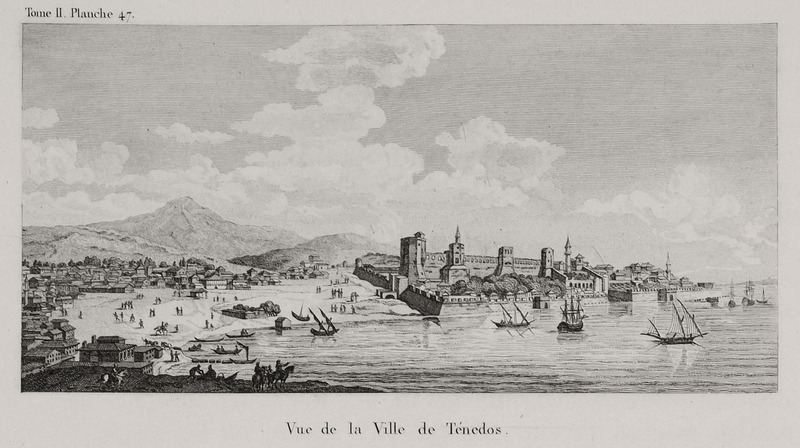 From Toulon, the French frigate with its select passengers sailed to Sardinia, Malta and Sicily, and put in at the port of Coroni. 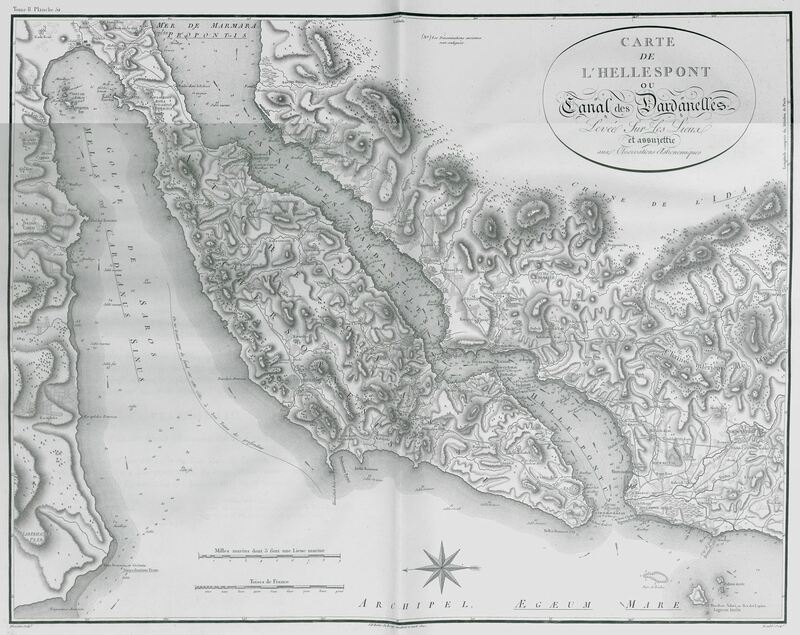 Then followed the islands of Cimolos, Melos, Siphnos, Sicinos, Ios, Santorini, Naxos, Tenos, Syros, Delos, Paros, Antiparos, Scyros, Lemnos, Lesbos, Chios, Samos, Patmos, Cos, Rhodes and Symi. 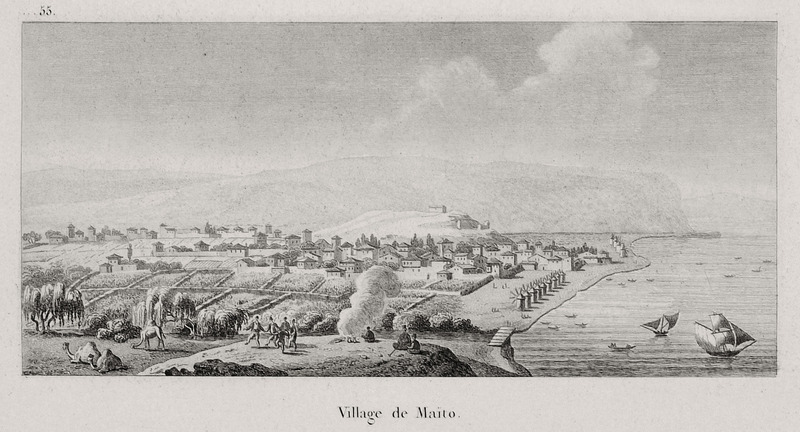 The party then crossed over to Çesme (Gr. 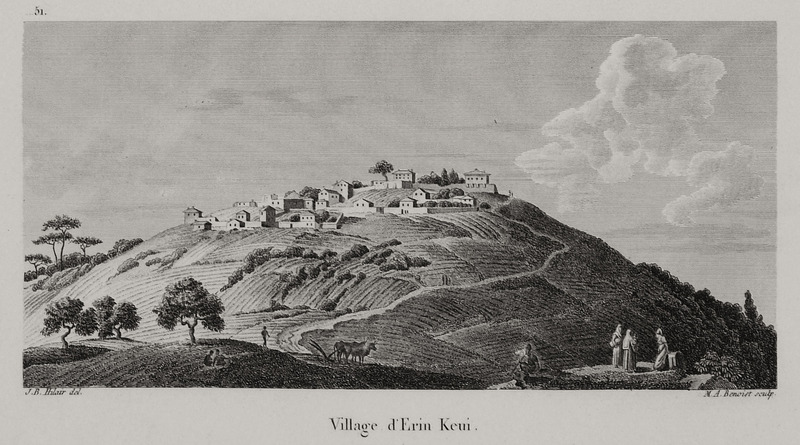 "Krene") opposite Chios, and Macre (pres. 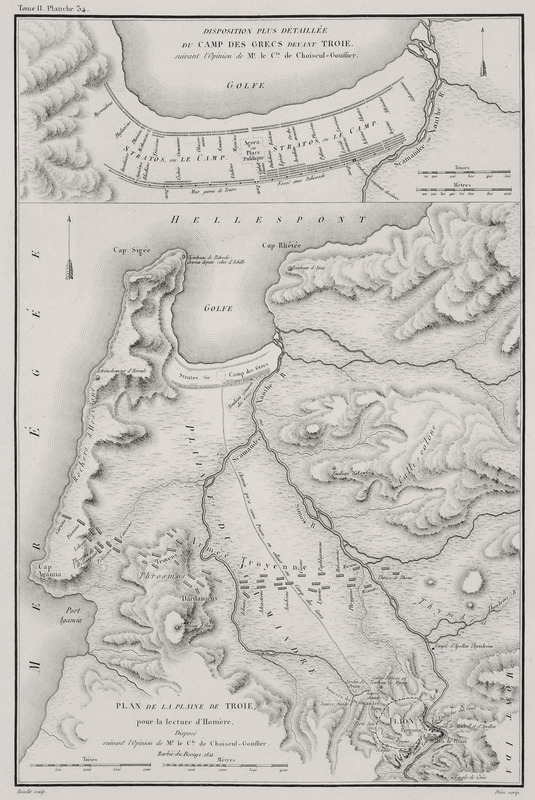 Fethiye), continuing their tour in western Asia Minor, visiting Telmessos, Mylassa, Stratonike, Bodrum-Halicarnassus, Iassos, Heraclea by Latmus, Didyma, Priene, Miletus, Ephesus, Teos and Smyrna. 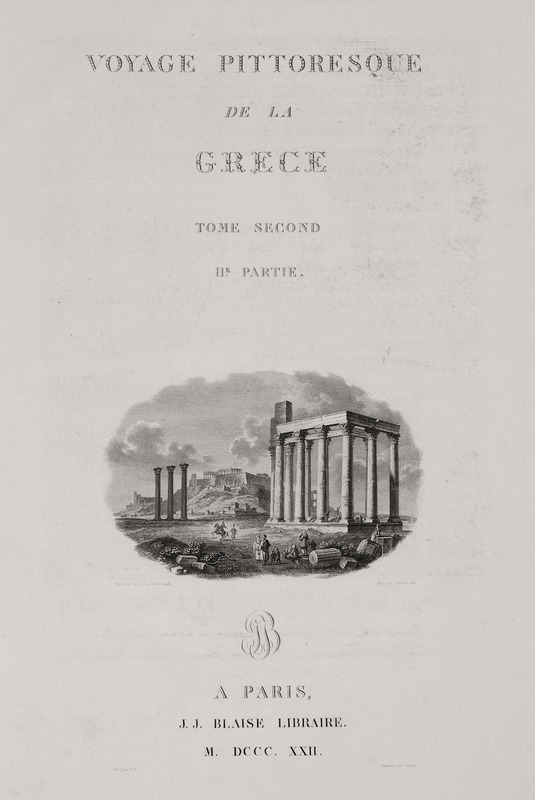 The second volume also deals with places in Asia Minor and the North Aegean such as Smyrna, Pergamus, Assus, Samothrace, and Troy. 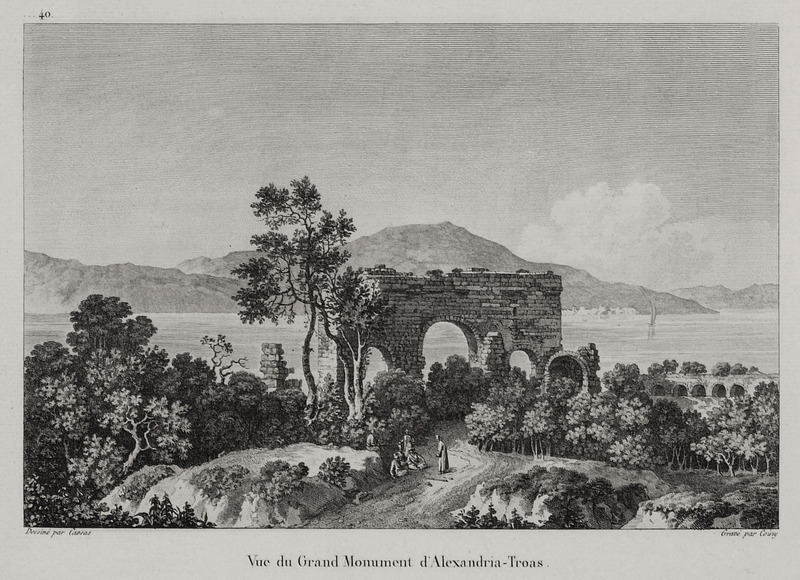 The third volume continues on to Alexandria Troas, Troy, Tenedos and the Straits of the Hellespont (Madytos, Abydos, Sestos, Callipolis and Lampsacus), and closes with Constantinople. 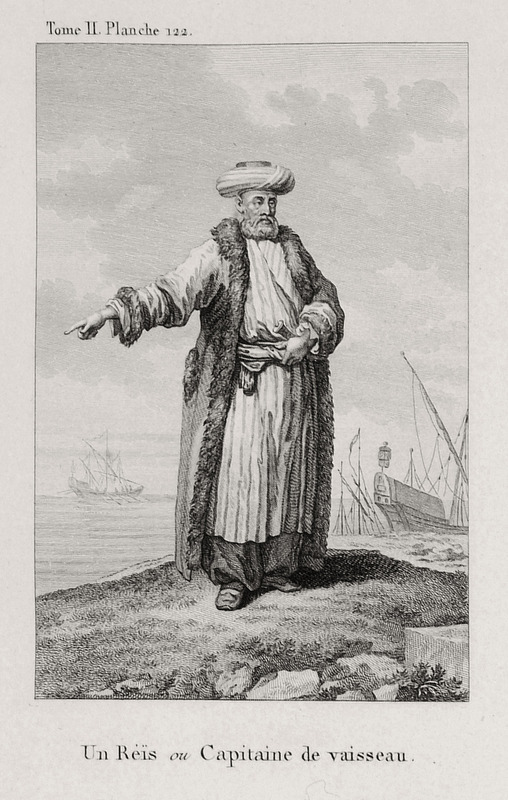 It presents the city’s main monuments and sights, the Bosporus and a series of portrait types of Ottoman officials, itinerant traders and the various ethnic minorities coexisting in the capital of the Ottoman Empire. 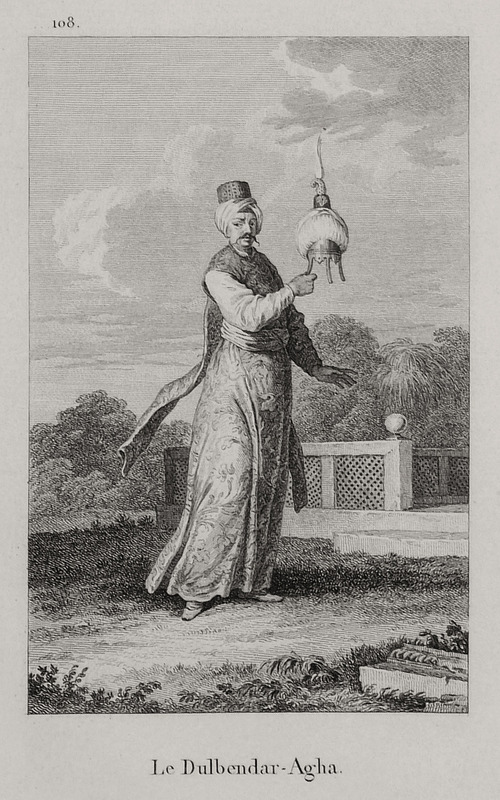 This original and unique work is a landmark in the history of travel literature, which influenced all subsequent publications in the genre. 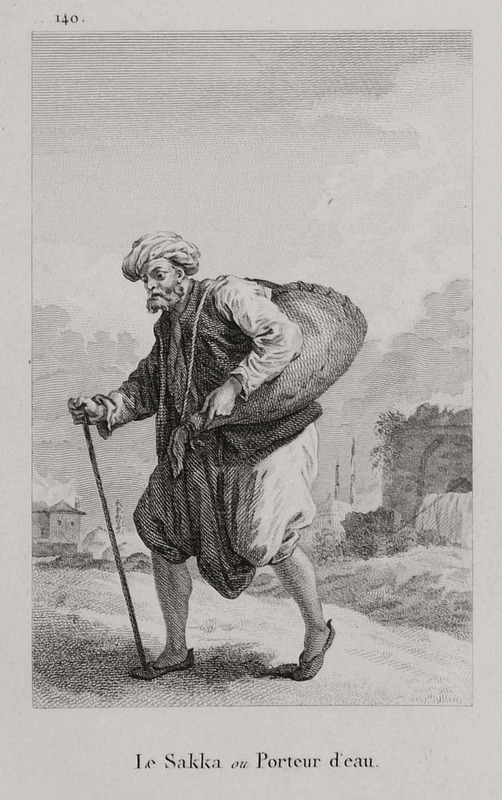 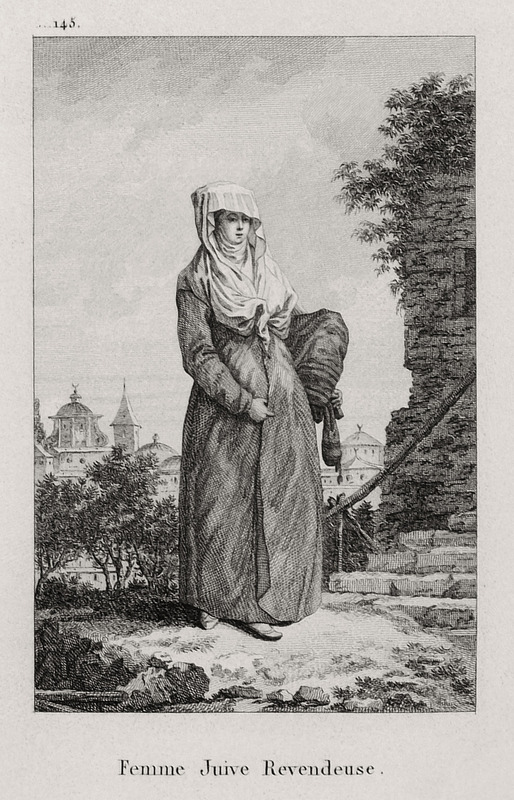 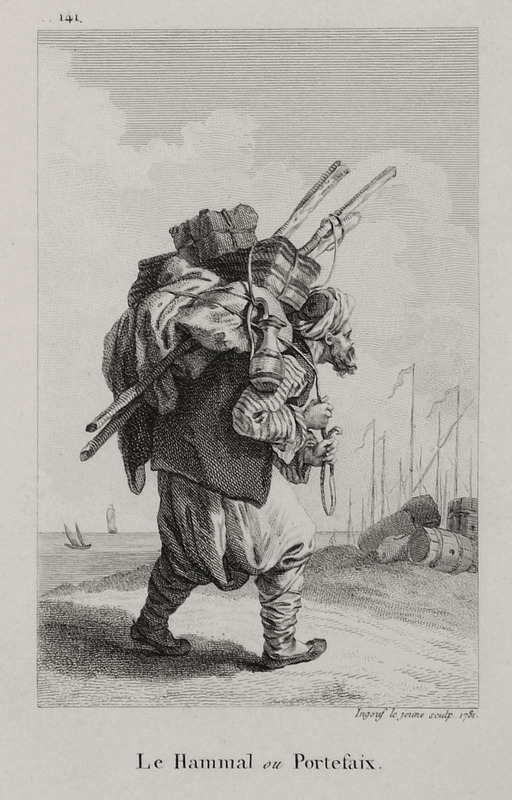 The subjects of its engravings were copied numerous times and used to illustrate other travel works. 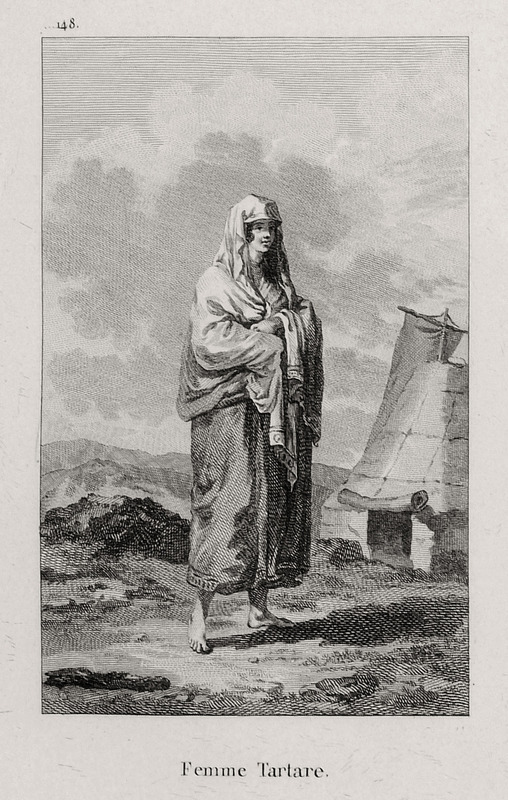 Even today, these images, especially those from the Greek islands, are still very popular and widely known. 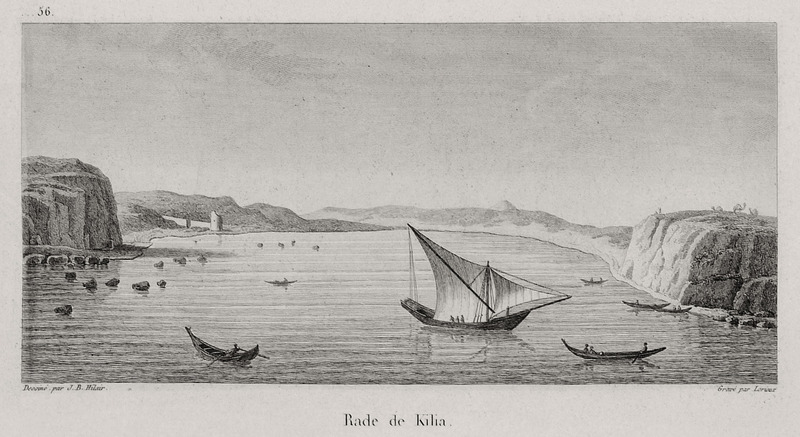 They bring to life the land of Greece and its people, in the special landscape peculiar to each place. 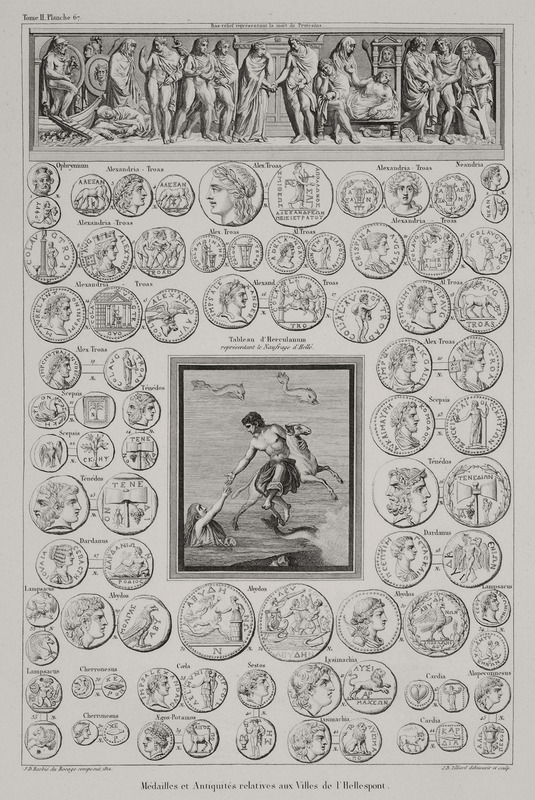 Title page of the third volume of the book. 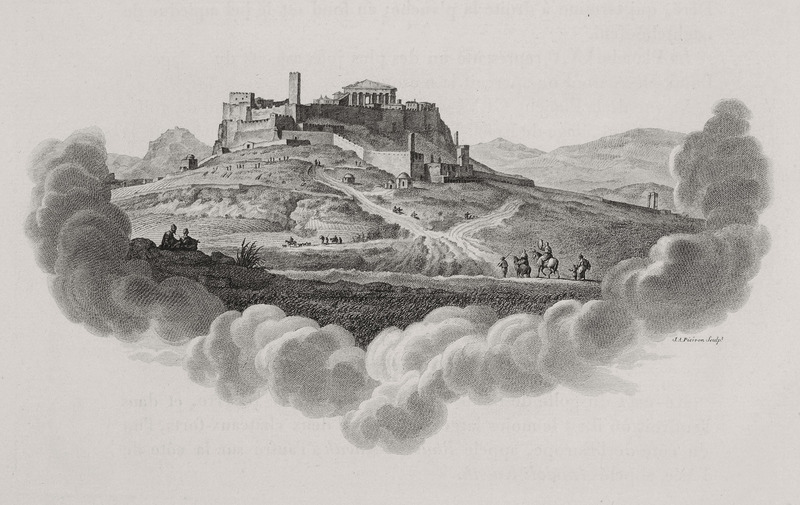 The Temple of Olympian Zeus and the Acropolis of Athens. 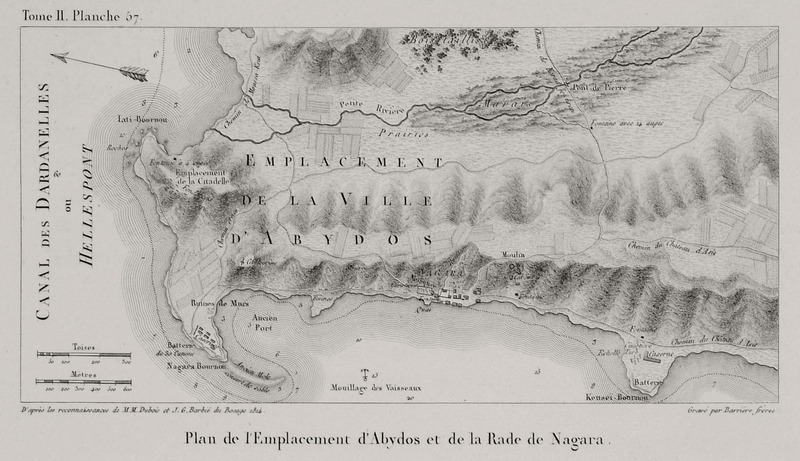 Map of the plain of Troy. 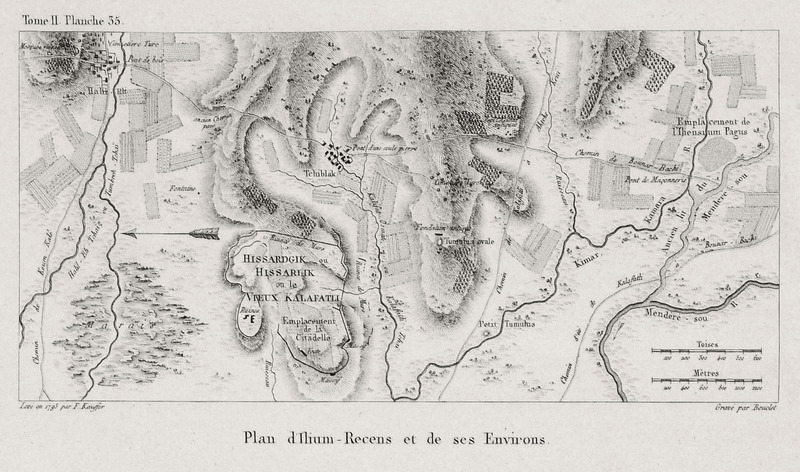 Map of the site of Troy. 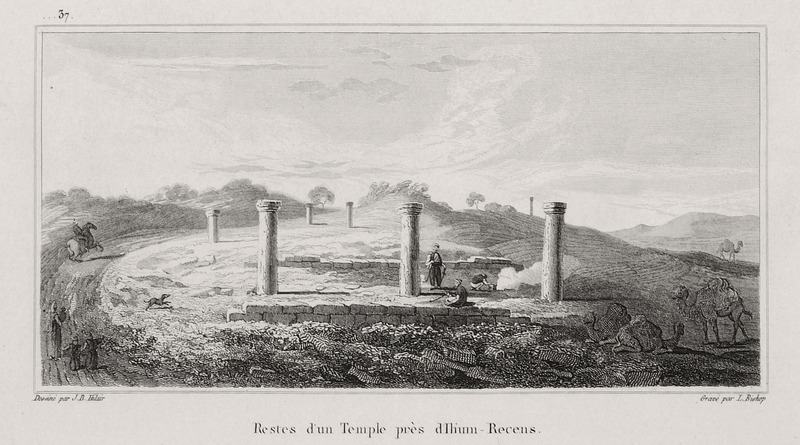 Remains of temples close to Troy. 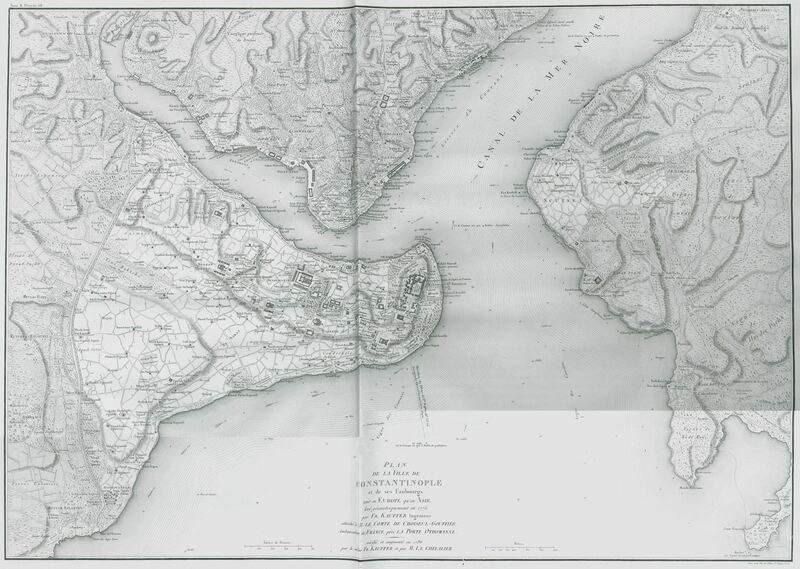 Map of Alexandria Troas (today Eski Stambul). 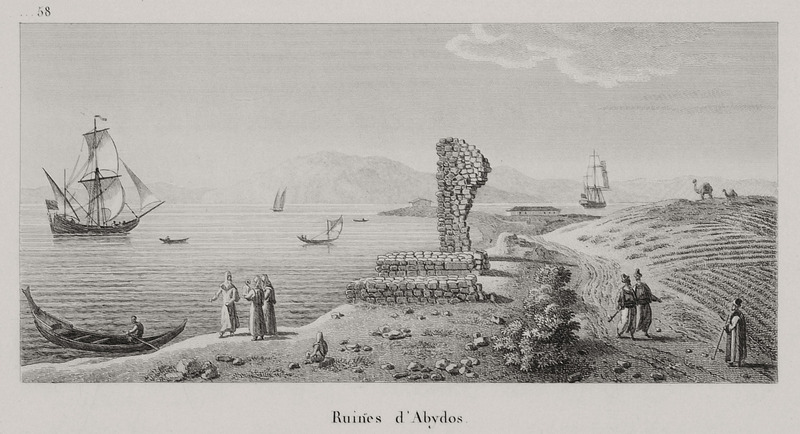 Remains at Alexandria Troas (modern Eski Stambul). 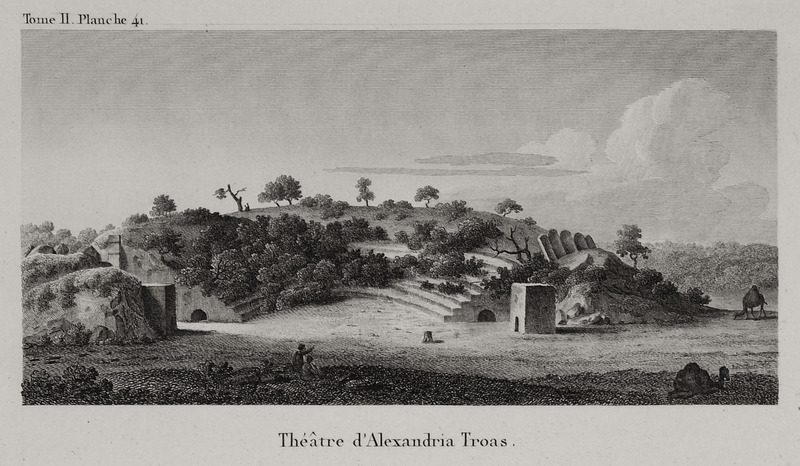 Ancient theater in Alexandria Troas (Eski Stambul). 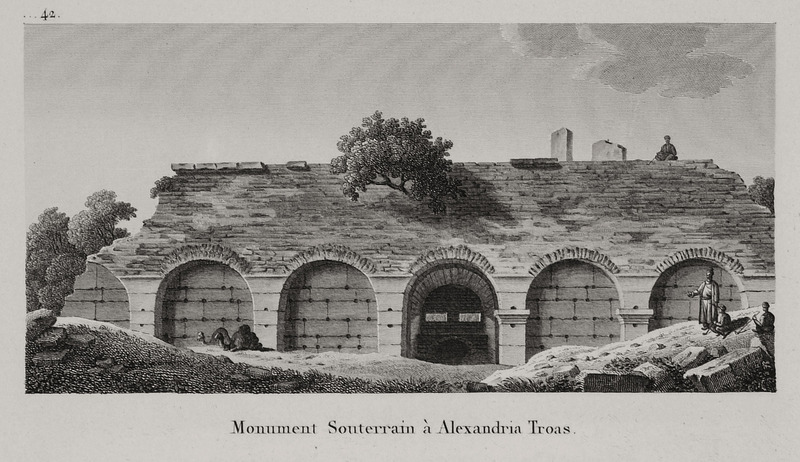 Underground monument in Alexandria Troas (today Eski Stambul). 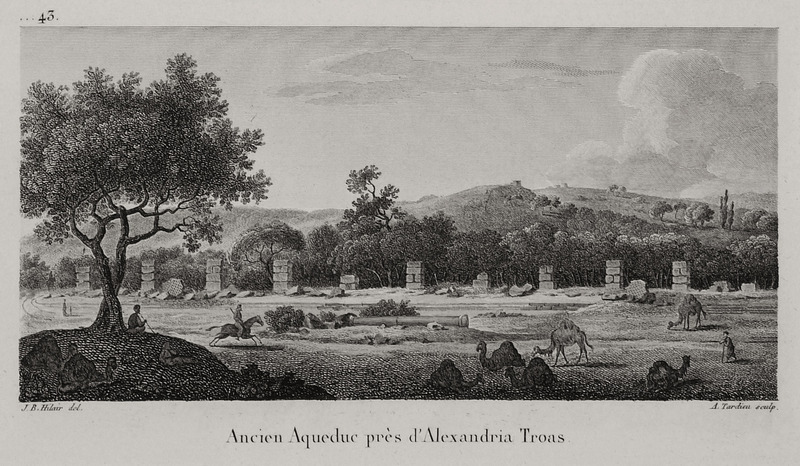 Remains of aqueduct in Alexandria Troas (today Eski Stambul). 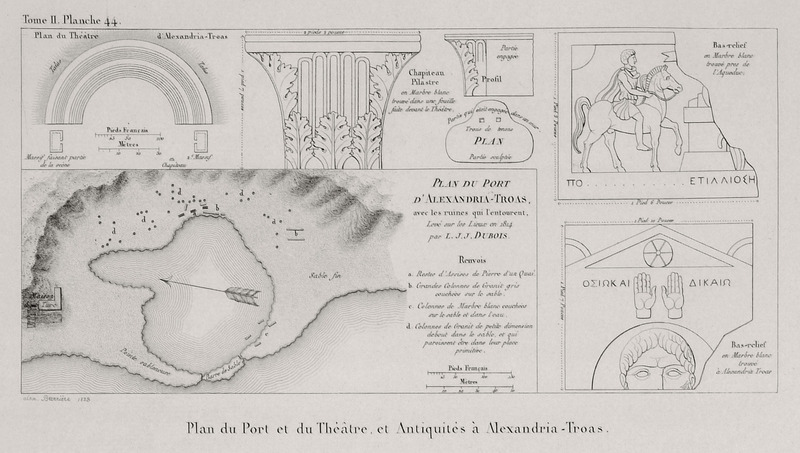 Alexandria Troas (today Eski Stambul): Plan of the port and the ancient theater. 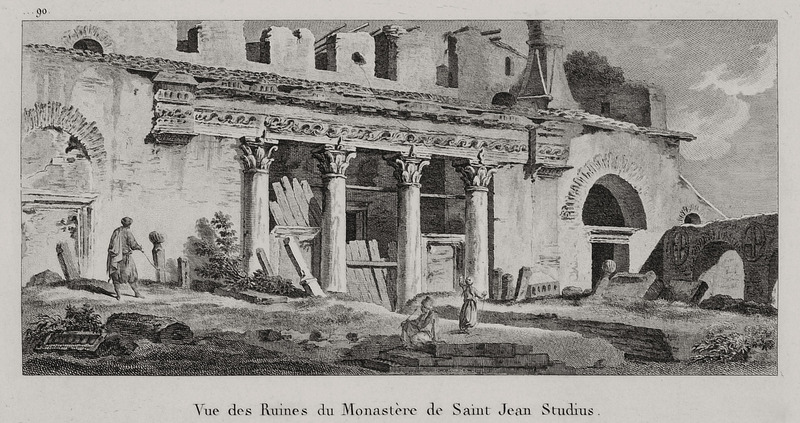 Antiquities. 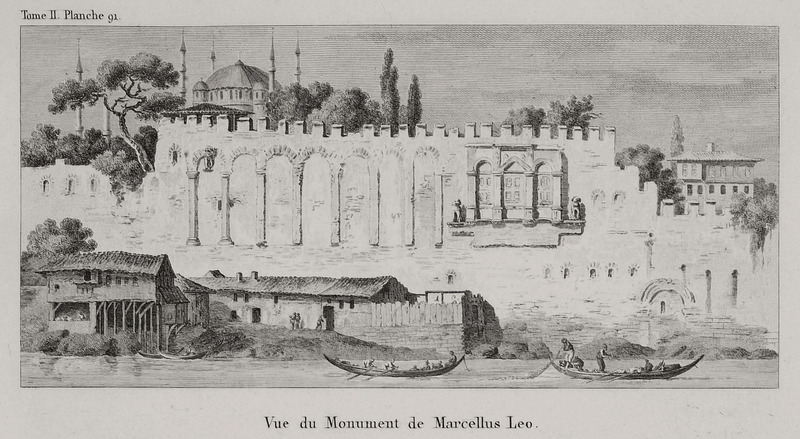 Arch and pillars of a building at Alexandria Troas (today Eski Stambul). 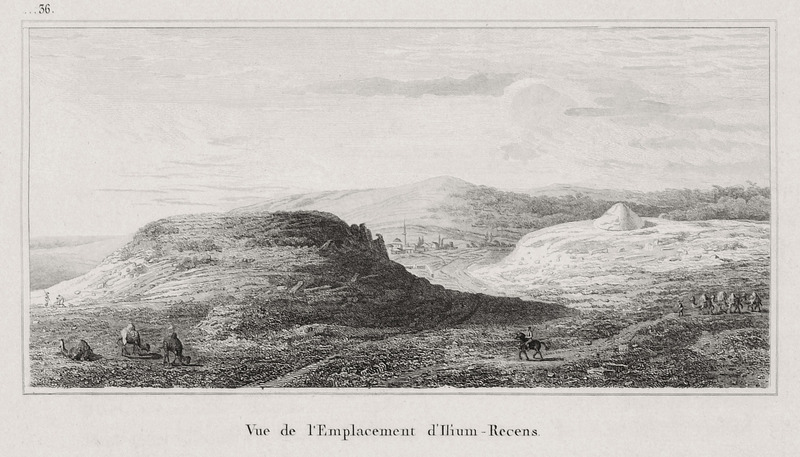 View of Kumkale fortress, near Yenişehir, Asia Minor. 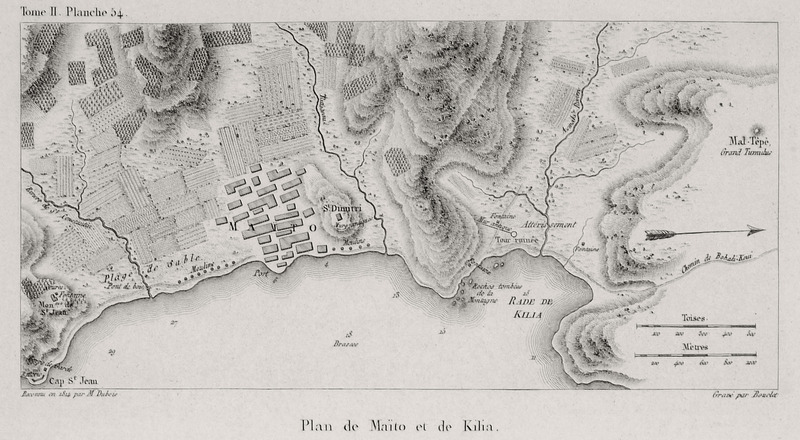 Map showing the place of ancient Abydos. 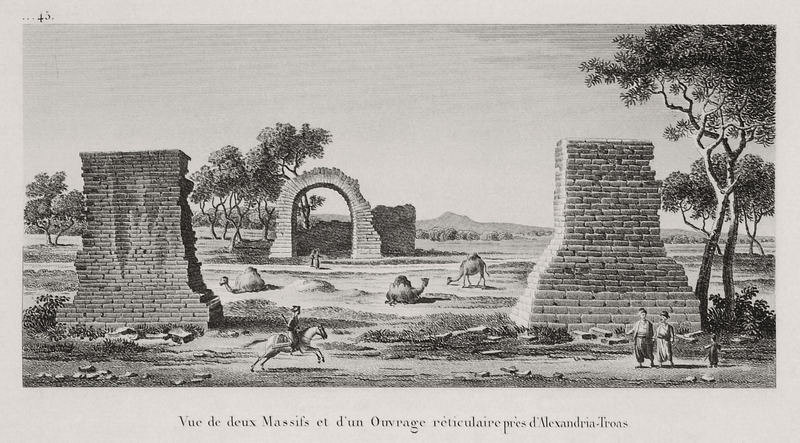 Mosque near the ancient city of Abydos. 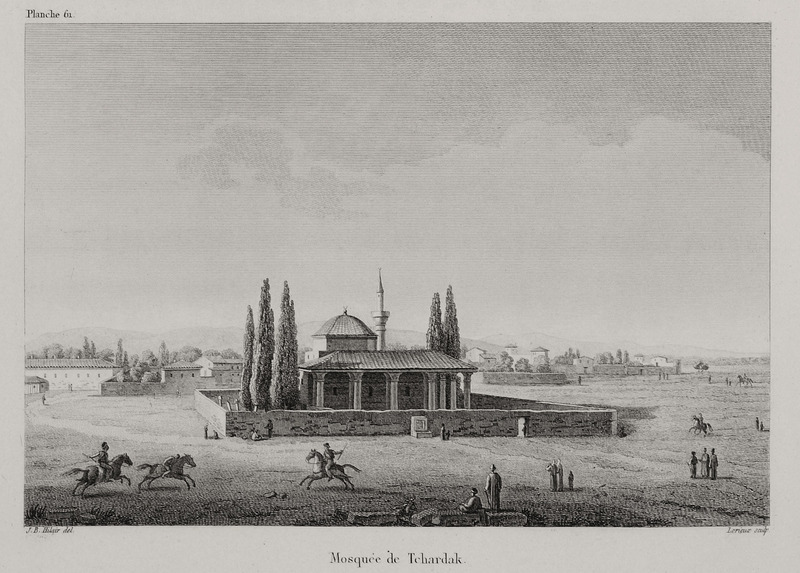 The mosque of the village Çardak, near Lapseki, Asia Minor. 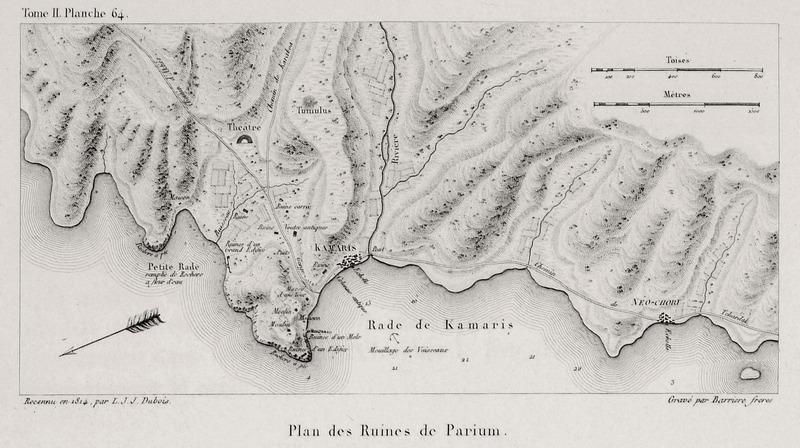 Map of the ruins of the ancient city Parium, Asia Minor. 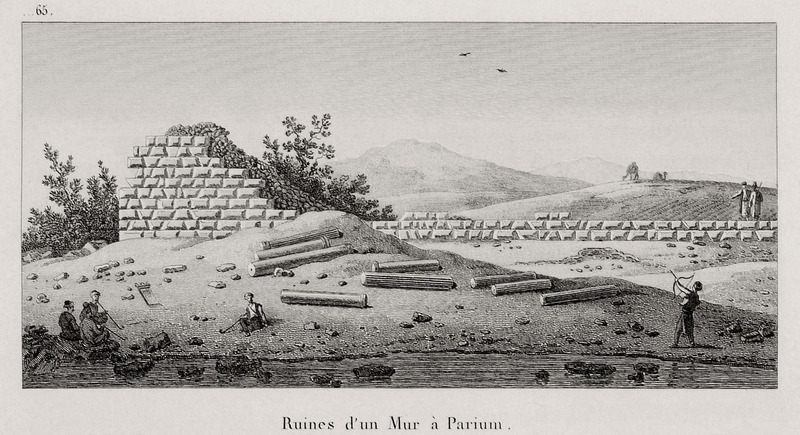 Ancient wall at Parium, ancient city in Asia Minor. 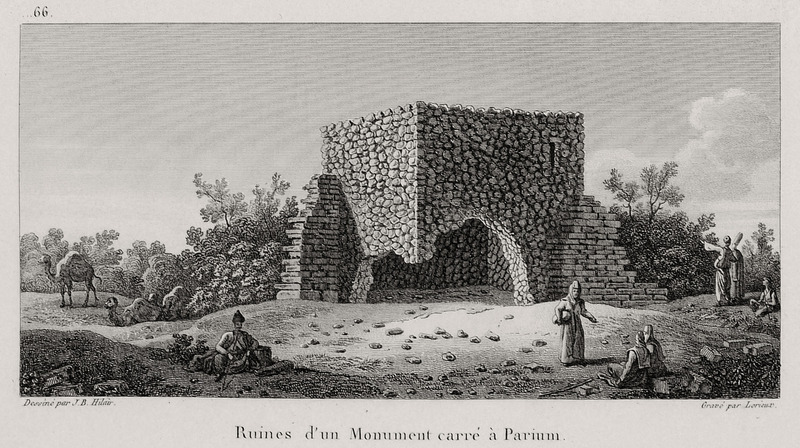 Ruins of monument at Parium, ancient city in Asia Minor. 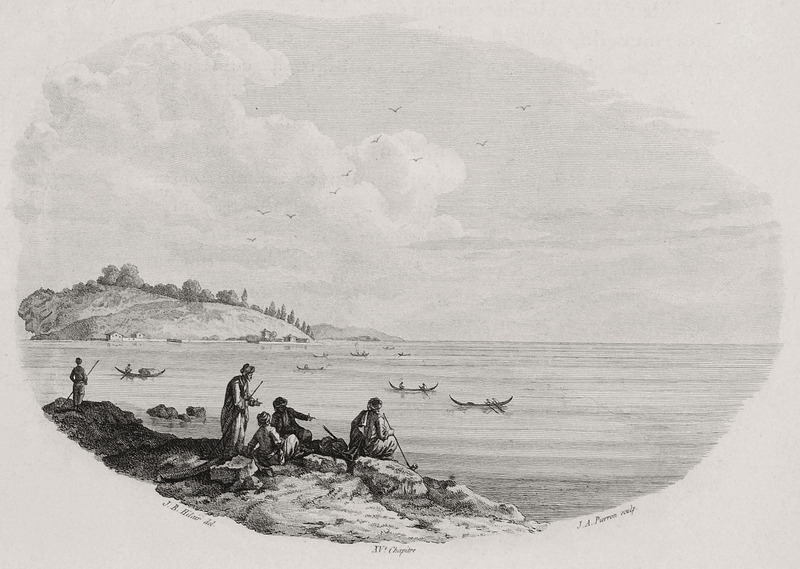 Everyday life scene on the shores of the Hellespont. 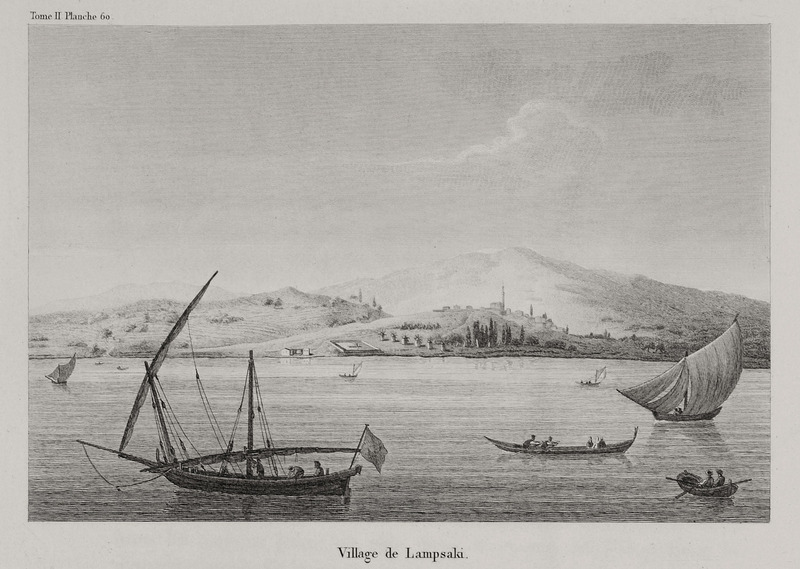 Everyday life scene on the shores of the Bosporus. 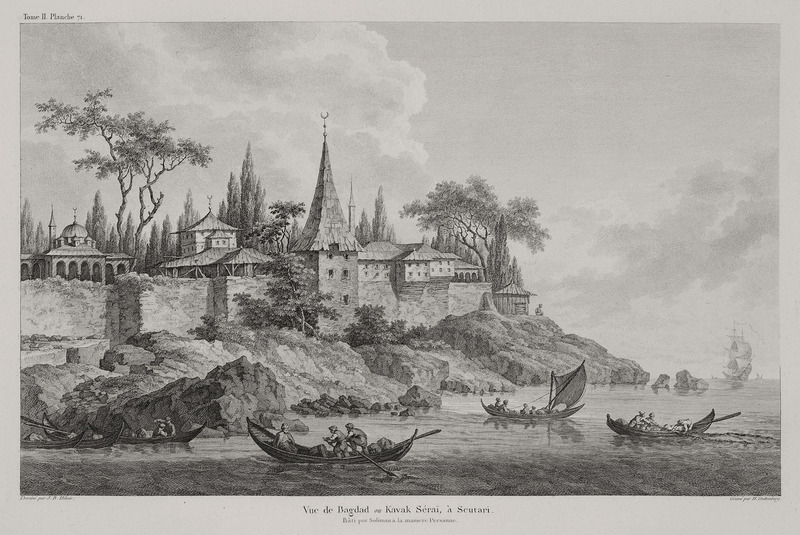 View of Yedikule Castle on the shores of the Sea of Marmara, Istanbul. 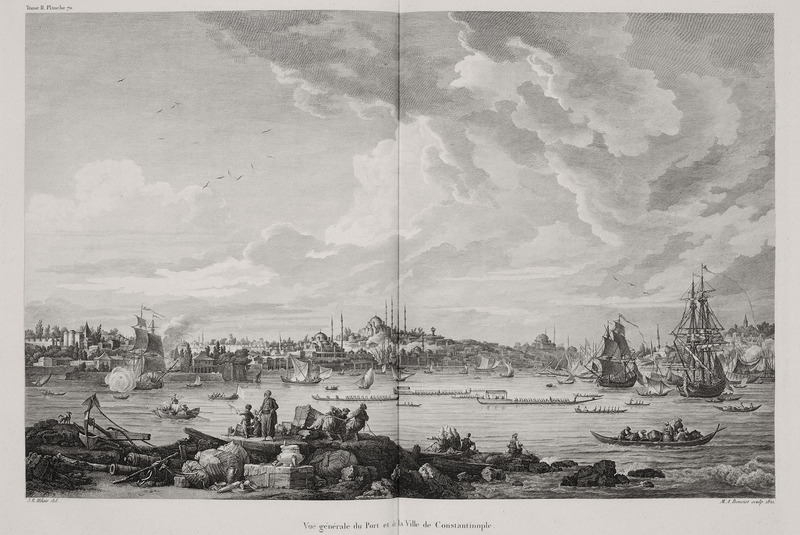 View of Istanbul and the Golden Horn. 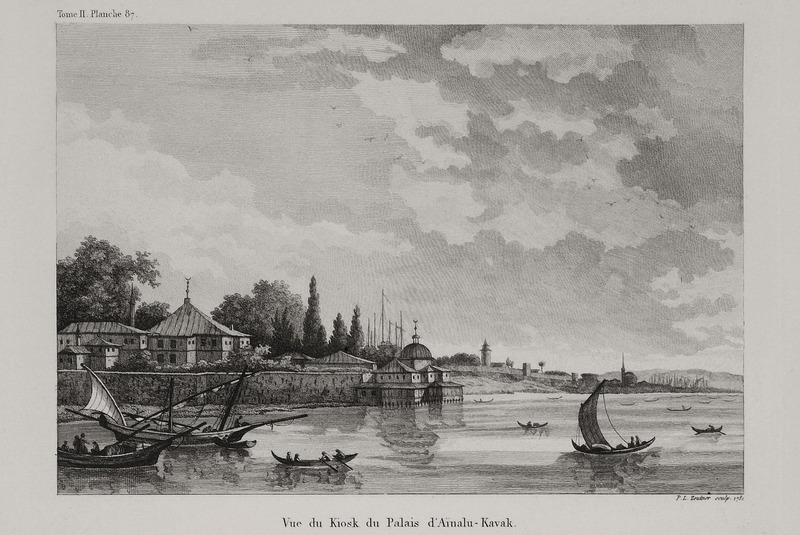 The Kavak Palace (or Palace of Mehmet Pasha) in Üsküdar, Istanbul. 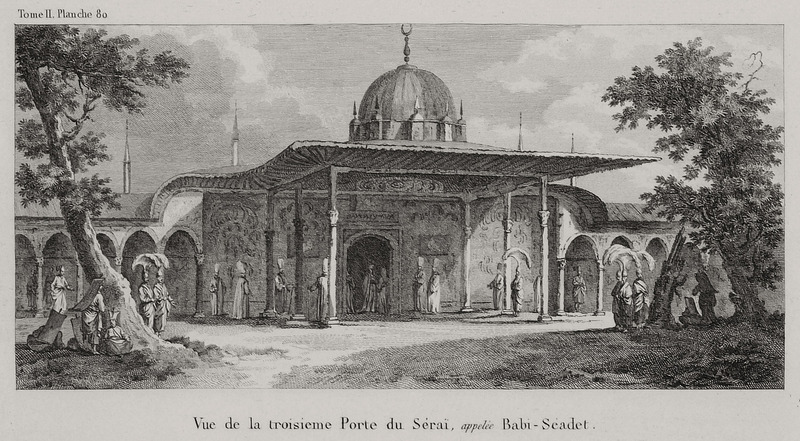 View of the Pearl Kiosk at Topkapi Palace, Istanbul. 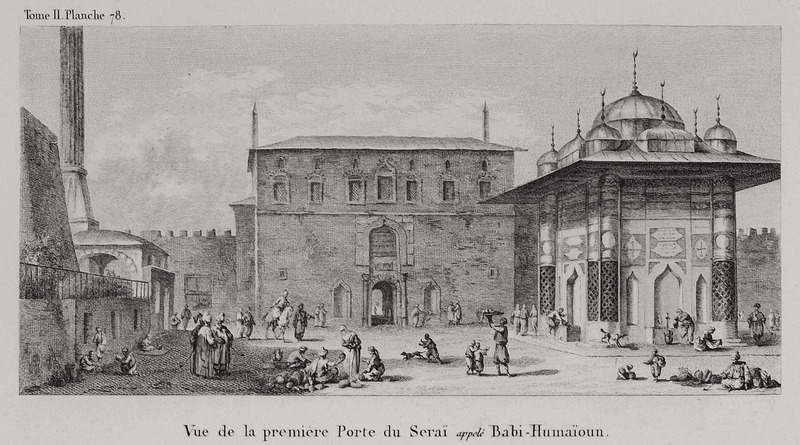 View of the now lost Gate of the Canons (Top Kapisi) of the Ottoman Imperial Palace. 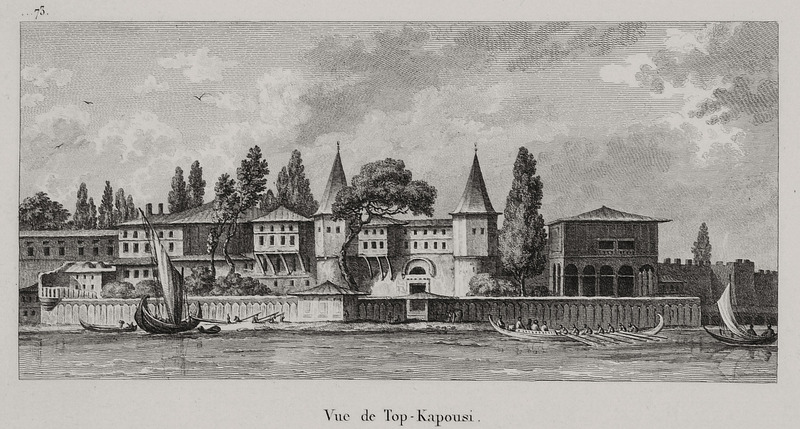 Initially called the New Palace, the Imperial Palace of Istanbul was renamed sometime in the early nineteenth-century as Topkapi after this gate. 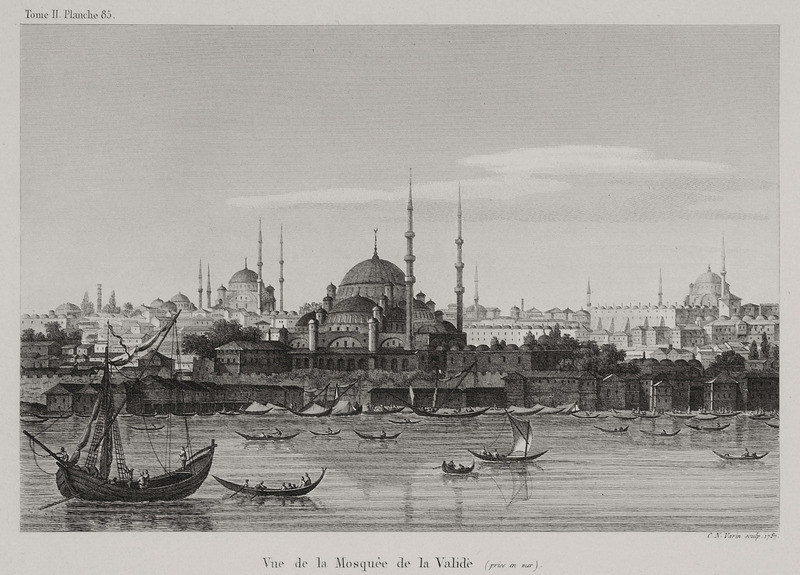 View of Maiden's Tower, Istanbul. 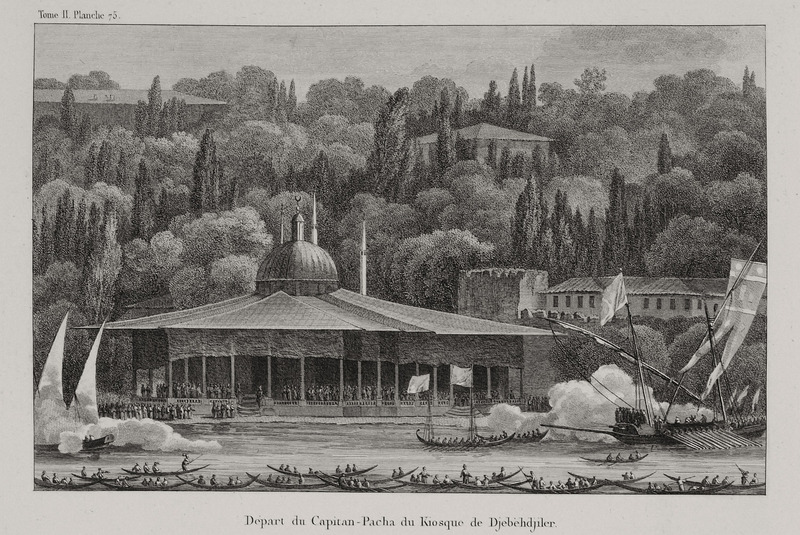 The departure of the Ottoman Admiral (Kapudan Pasha) from Cebeciler Kiosk at Eminönü, Istanbul. 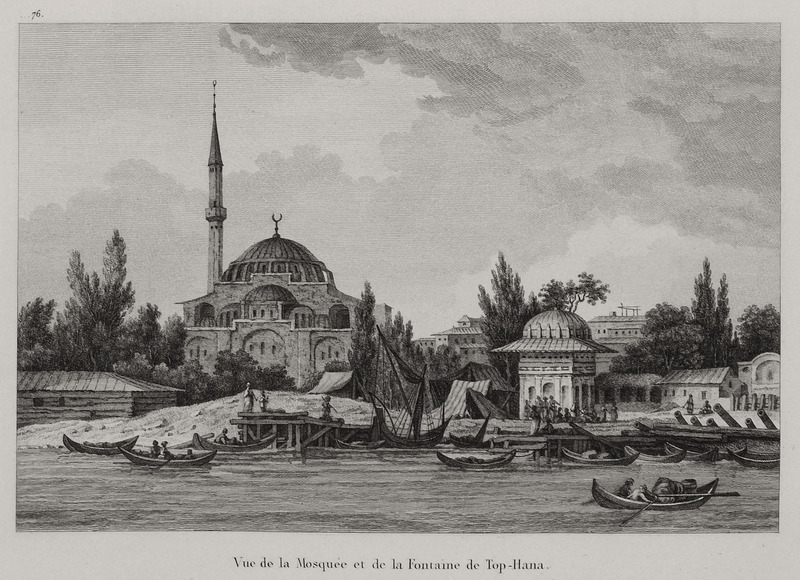 The Kılıç Ali Paşa Mosque and the Fountain of Sultan Mahmud I at Tophane, Istanbul. 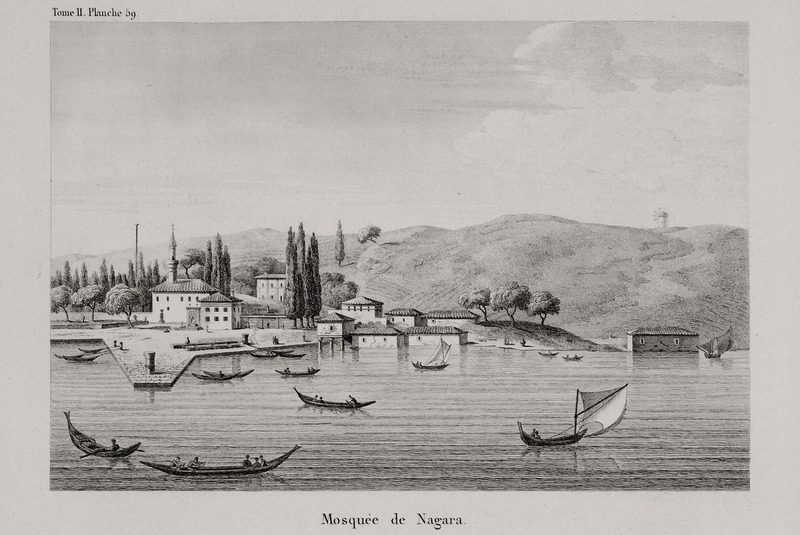 View of Seraglio Point from Galata Tower. 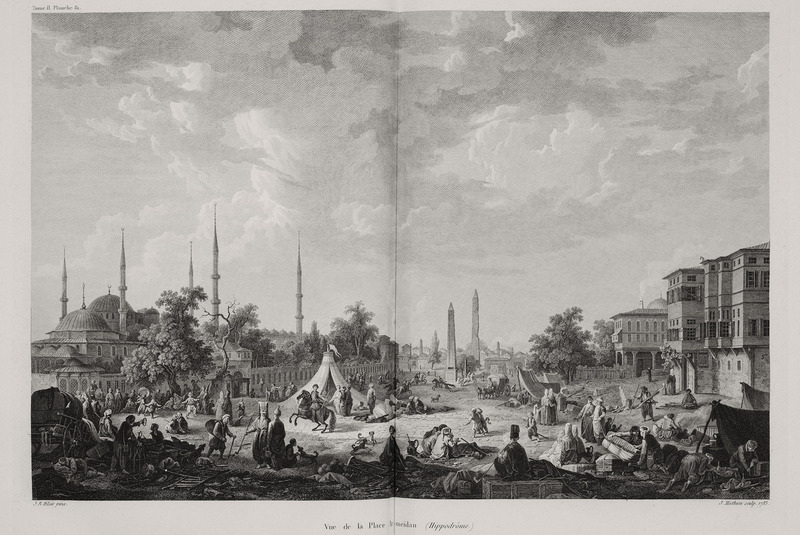 View of Tophane square in Istanbul. 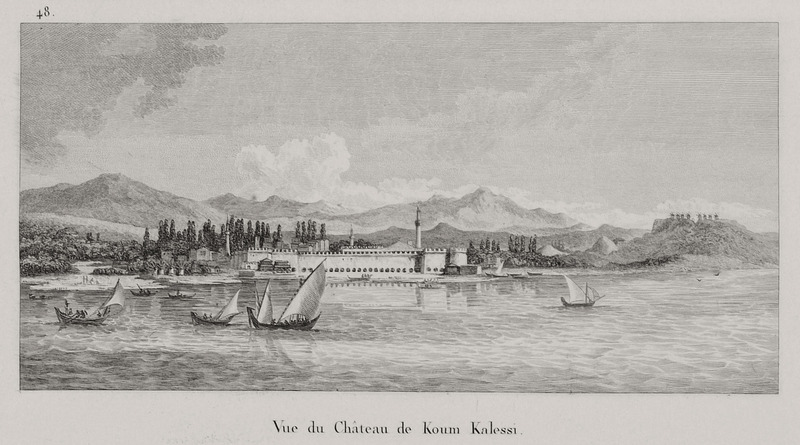 In the background the Imperial Armory and the Mosque of Kılıç Ali Paşa. 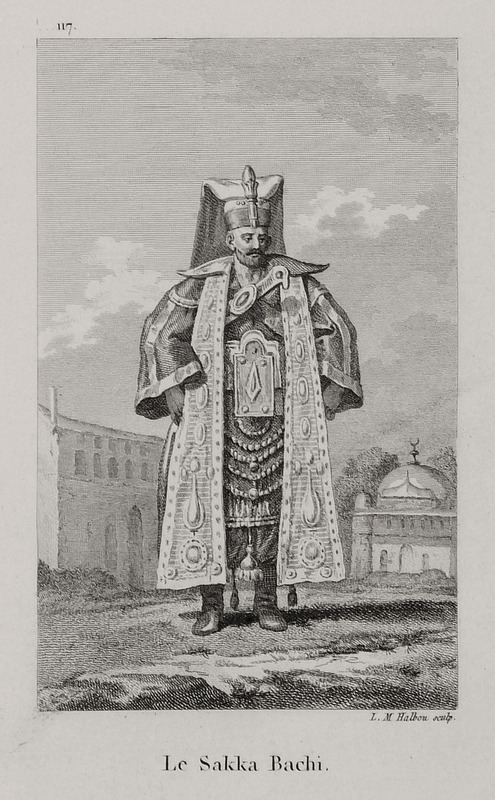 Portrait of Grand Vizier Hasan Pasha. 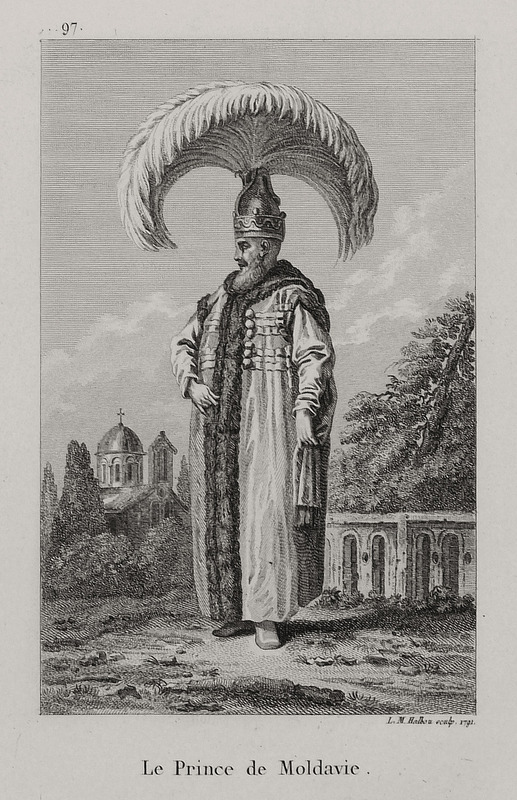 Portrait of the Prince (Governor) of Moldavia, Grigorios Gikas. 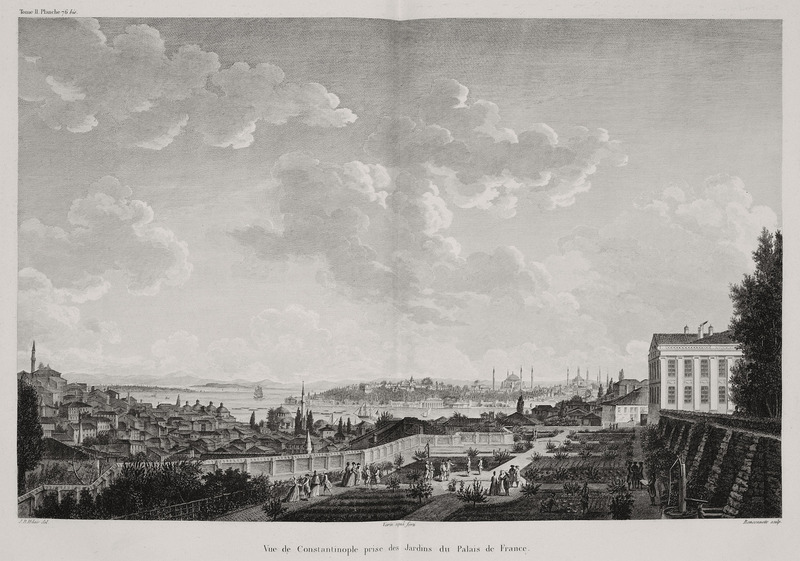 View of Istanbul from the French Embassy at Pera (Beyoğlu). 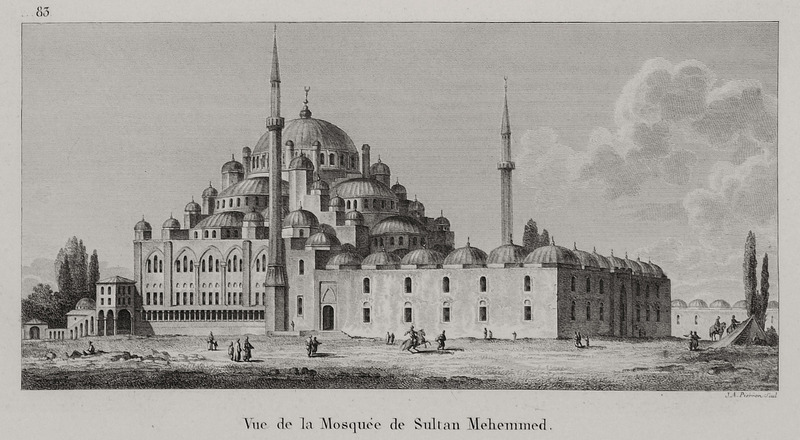 The New Mosque at Eminönü, Istanbul. 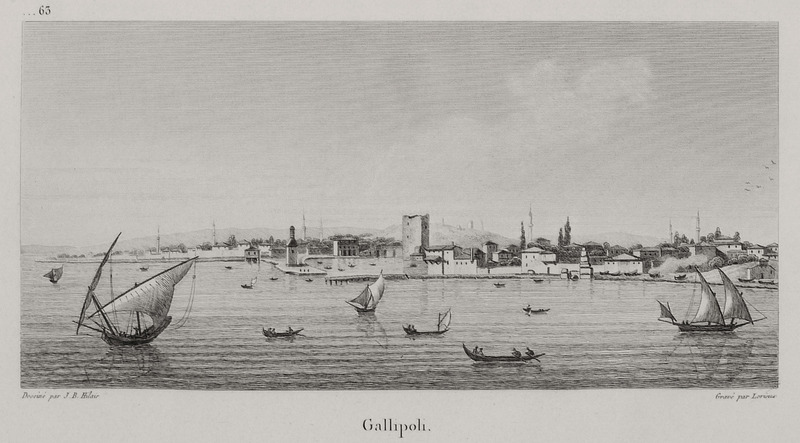 View of the Third Gate of the Topkapi Palace, known as Gate of Felicity. 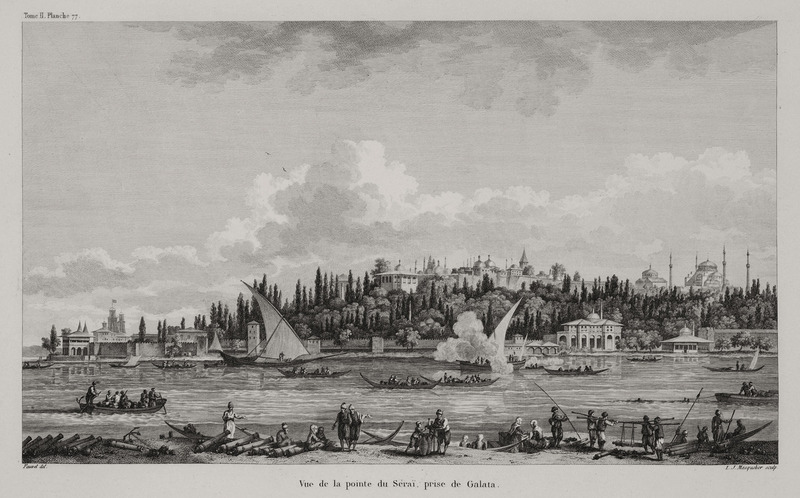 View of Aynalıkavak Palace and part of the Ottoman shipyards on the Golden Horn. 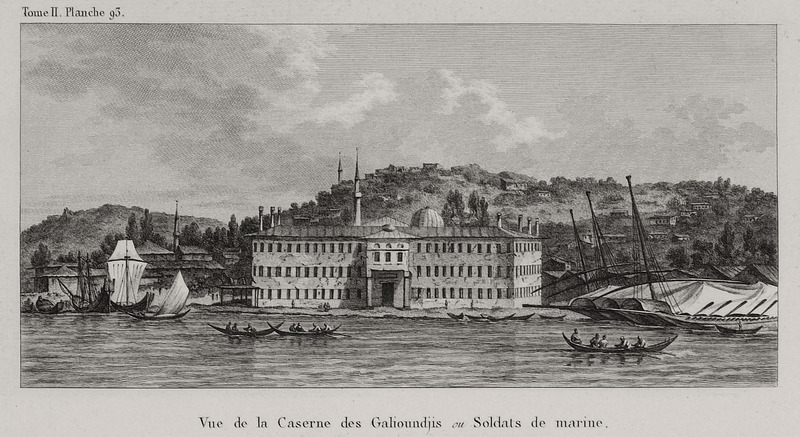 View of the military barracks in Istanbul. 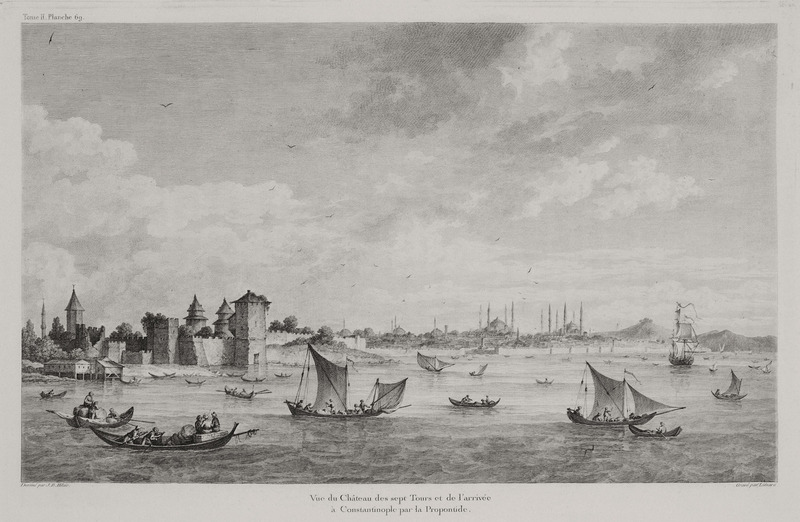 View of the Second Gate of Topkapi Palace, know also as Middle or Gate of Salutation. 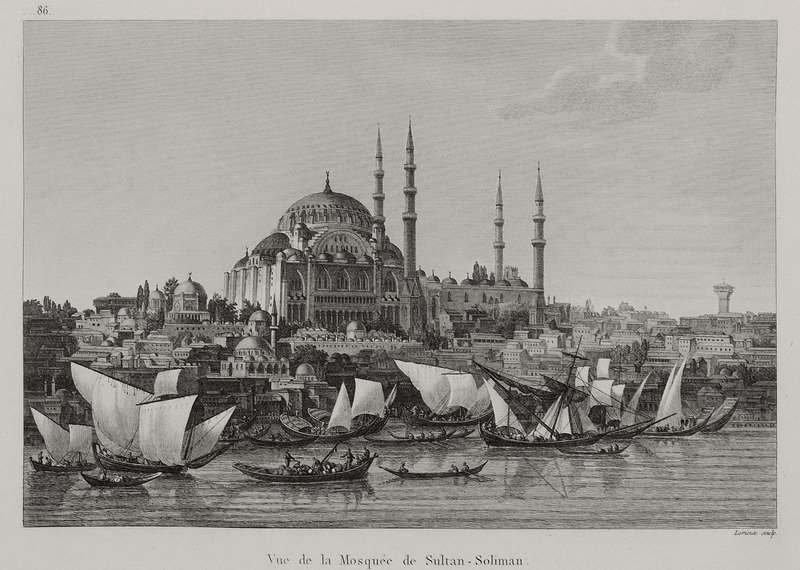 The Mosque of Sultan Mehmed II in Istanbul. 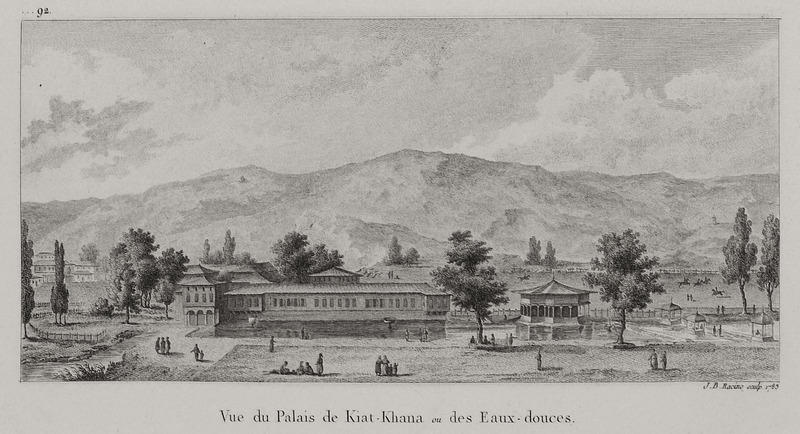 The now lost Saadabad Palace at Kağıthane (also known as Sweet waters of Europe). 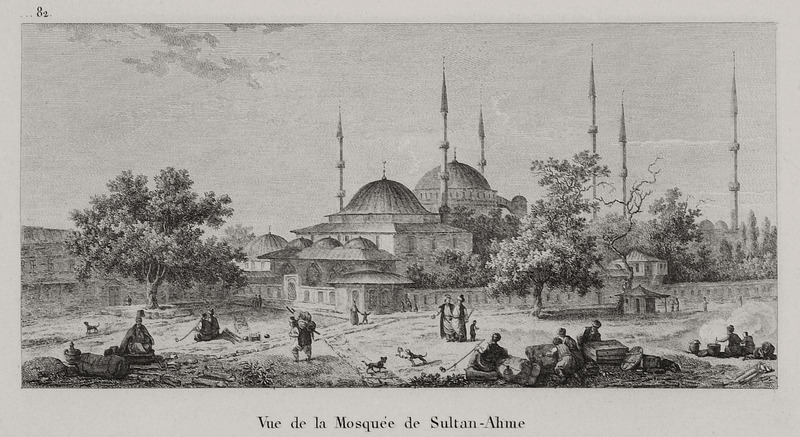 View of the Mosque of Sultan Süleiman I. 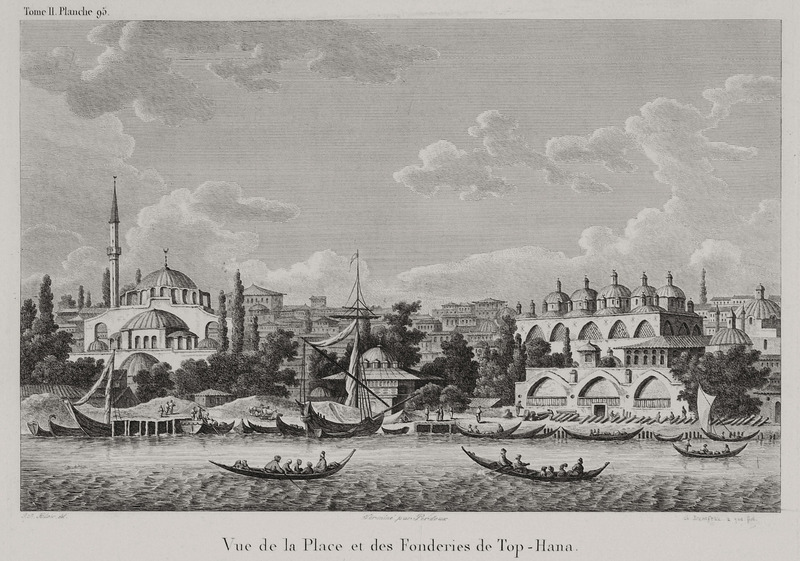 View of Aynalıkavak Palace, Istanbul. 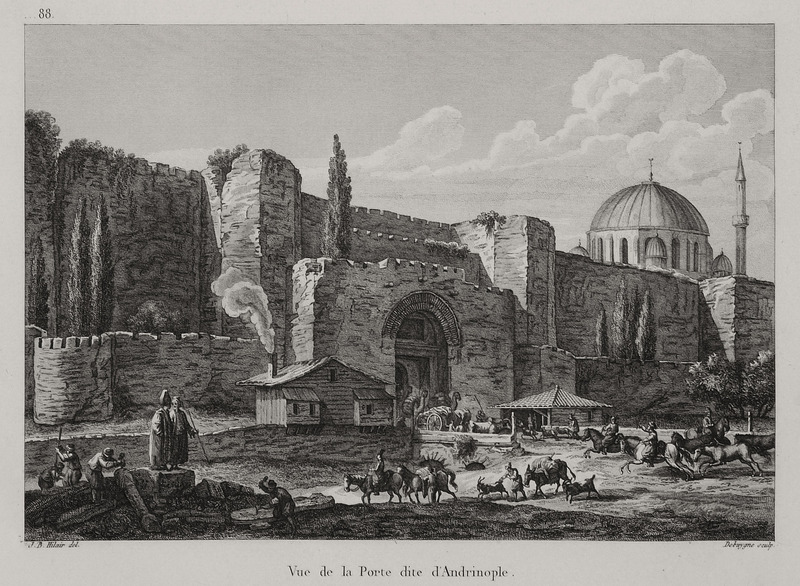 View of Edirne Gate, at the walls of Istanbul. 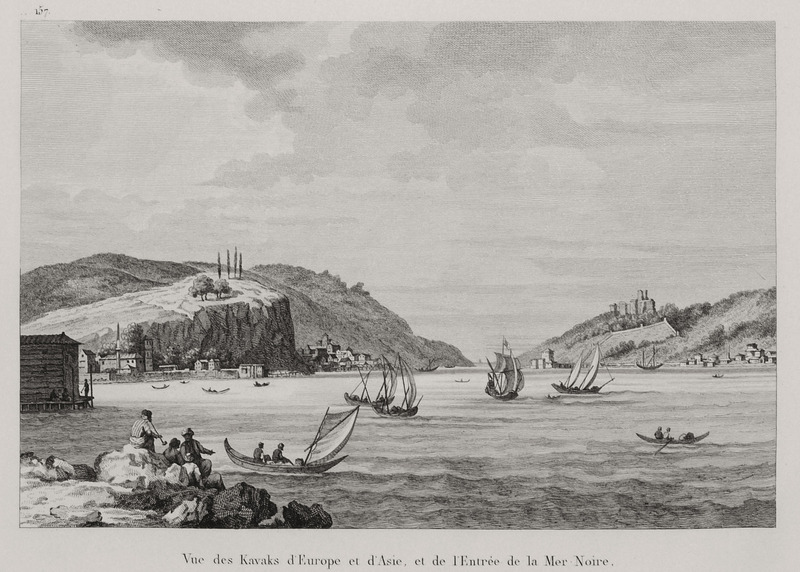 View of the seaside walls of Istanbul. 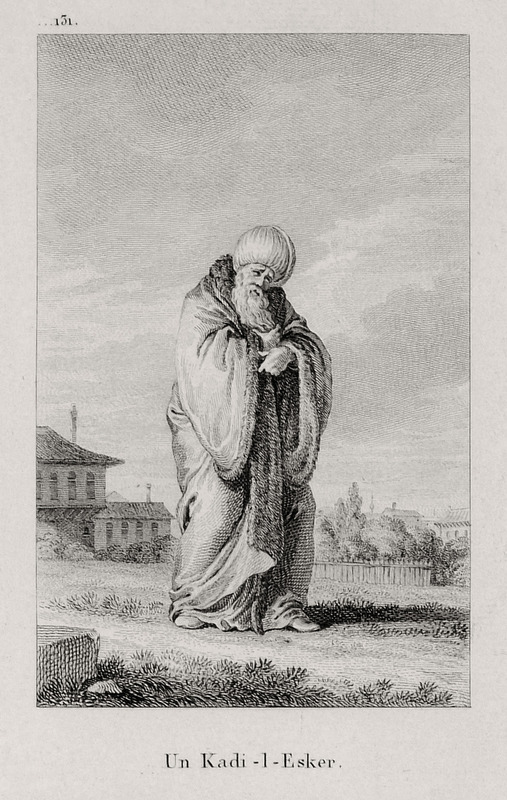 View of the remains of the Monastery of Stoudios, Istanbul. 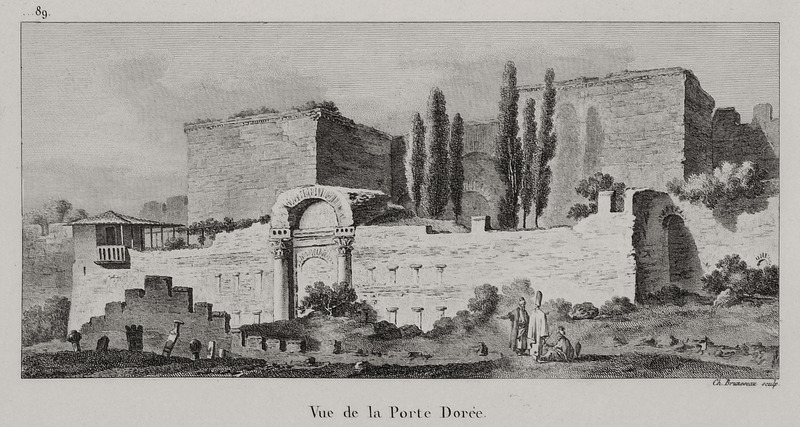 View of the Golden Gate at the walls of Istanbul. 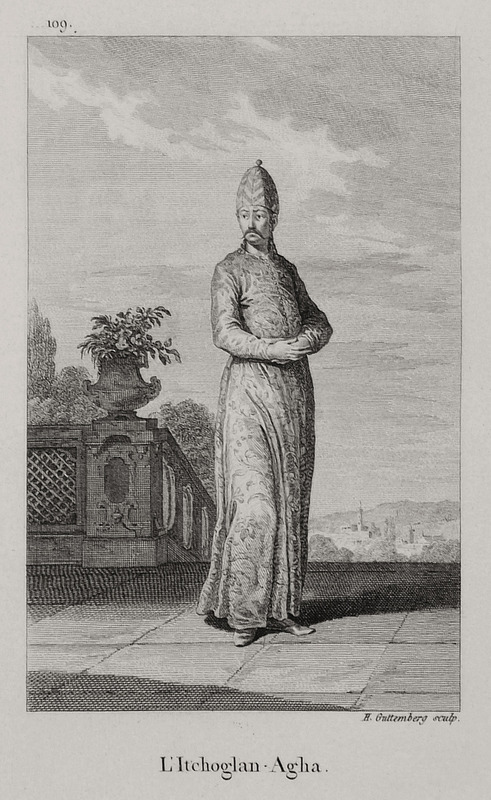 Portrait of Sultan Abdülhamid I.
Kizlar Aga, head of the black eunuchs of the Imperial Palace. 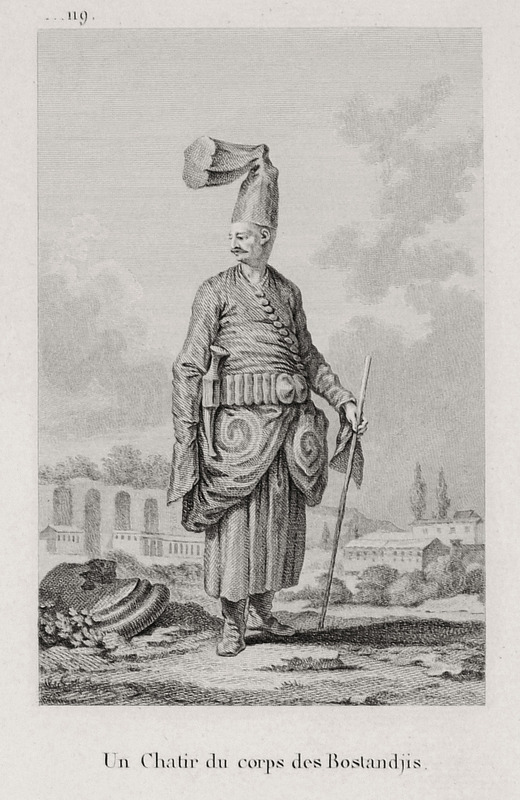 Silahdar Aga, head of the cavalry corp.
Bostancıbaşı, head gardener and executioner, in ceremonial dress. 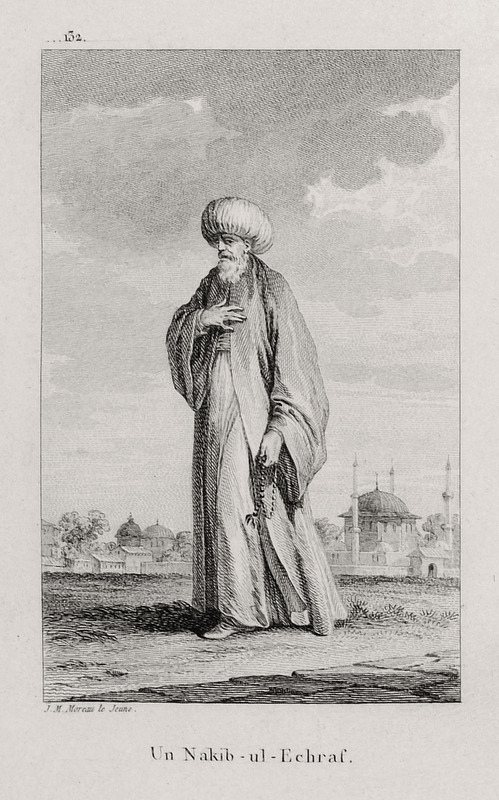 Reis Efendi, minister of foreign affairs. 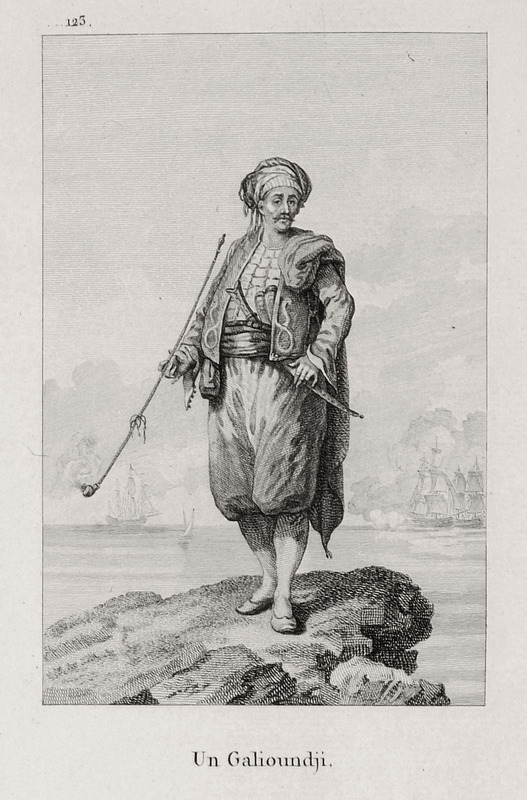 Kapudan Paşa, admiral of the Ottoman fleet. 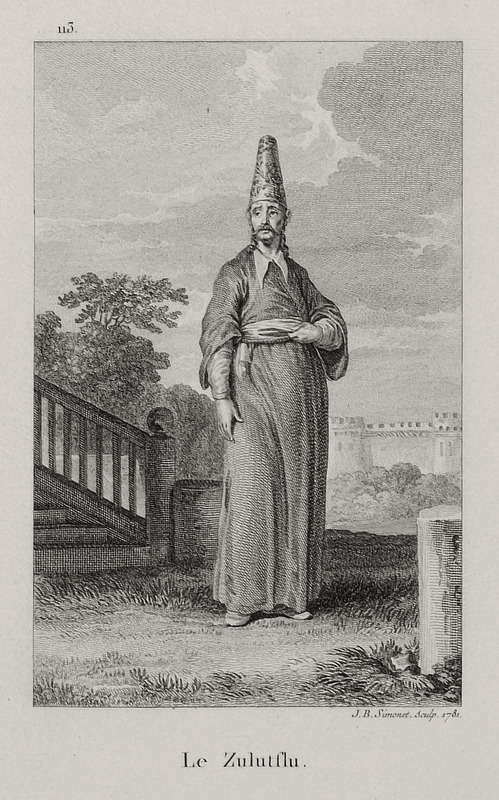 Kapı Ağası, head of the white eunuchs of the Sultan's palace. 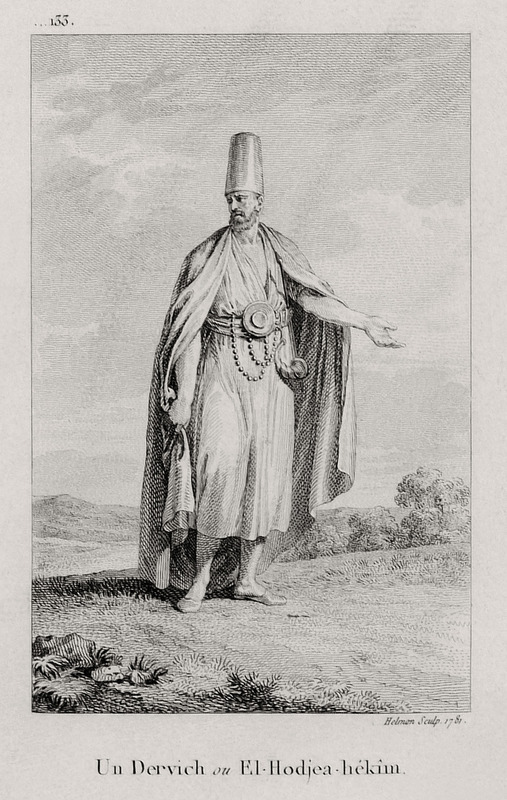 Ibriktar Ağası, water bearer to the Sultan. 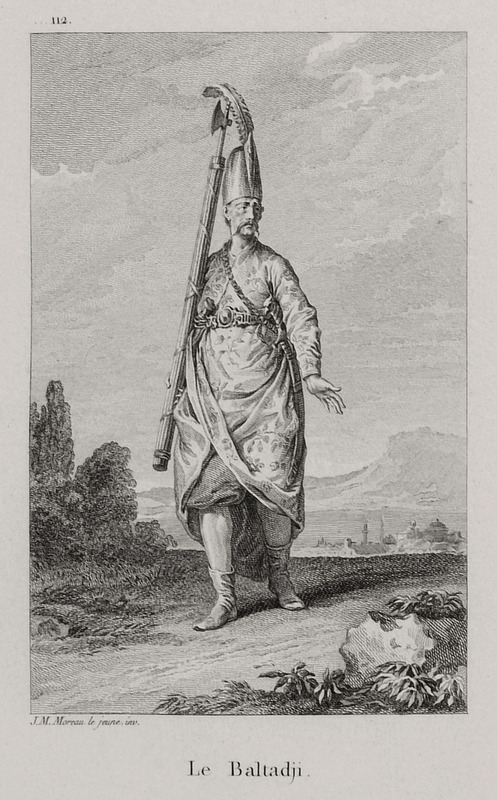 Dülbendar Ağası, keeper and bearer of Sultan's turban. 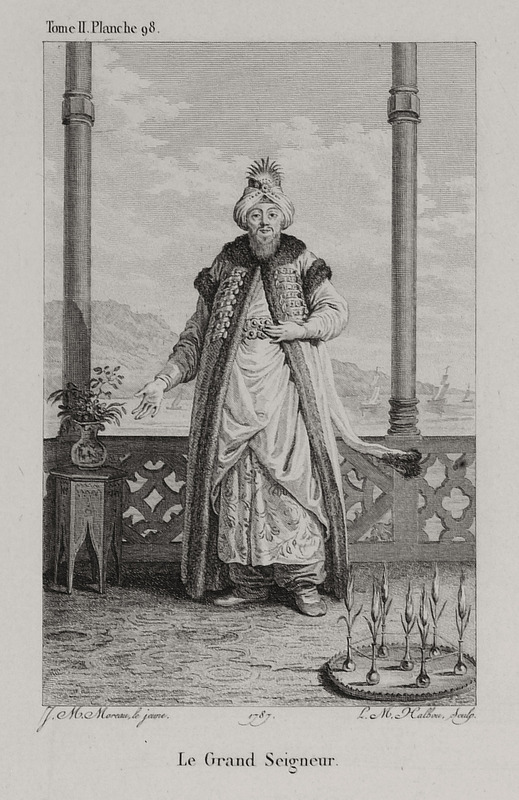 İçoğlan, servant to the Sultan inside the palace. 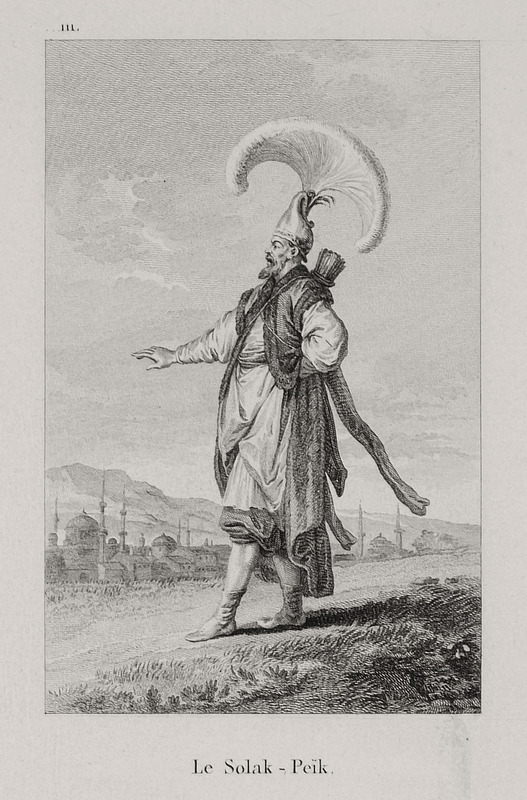 Solakbaşı, captain of the Sultan's guard. 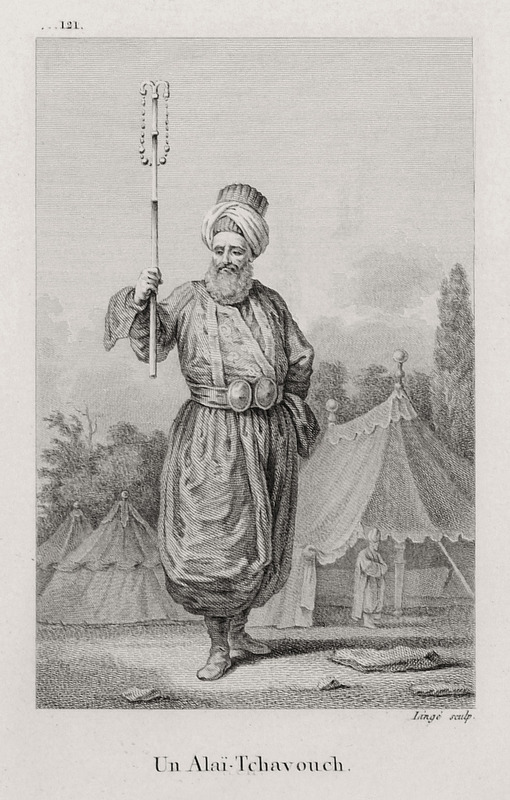 Solak, guard to the Sultan. 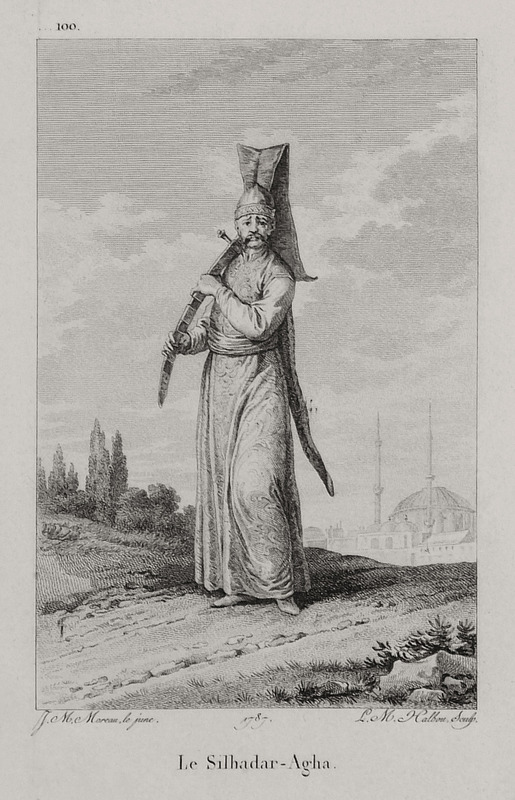 Baltacı, Palace guardian skilled with axe. 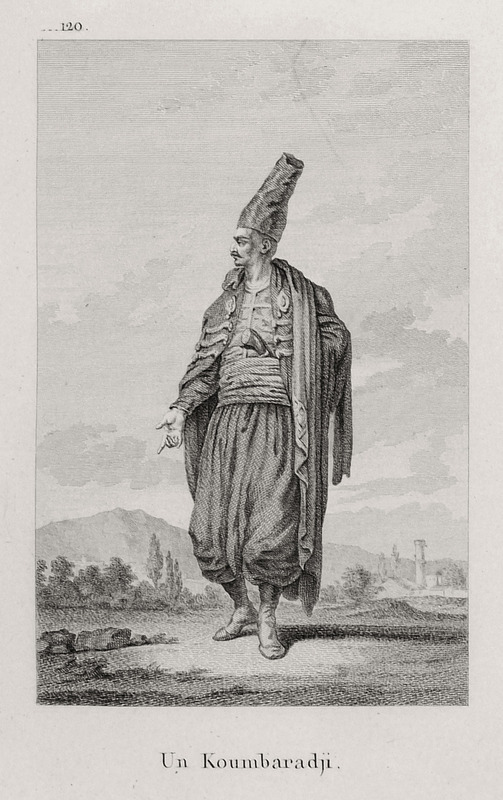 Zülüflü Baltacı, servant who guards imprisoned princes. 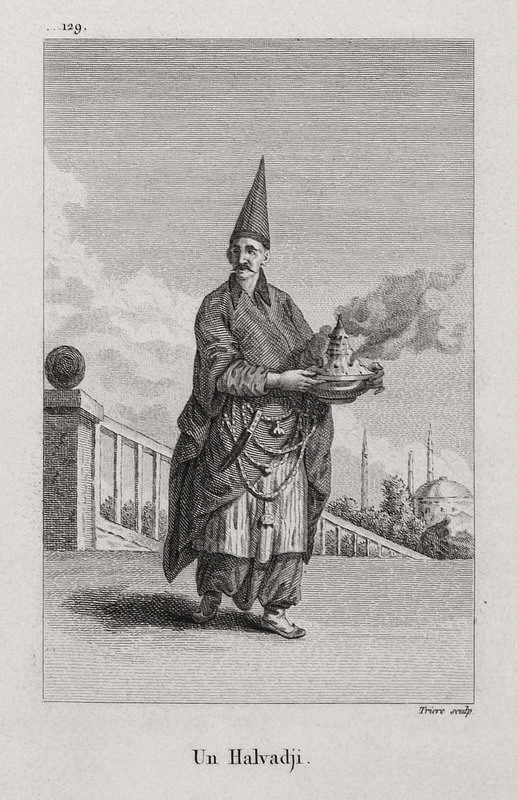 Kül kethudası, assistant to the Aga of the Janissary corp.
Başçavuş, head of the ushers in the Sultan's palace. 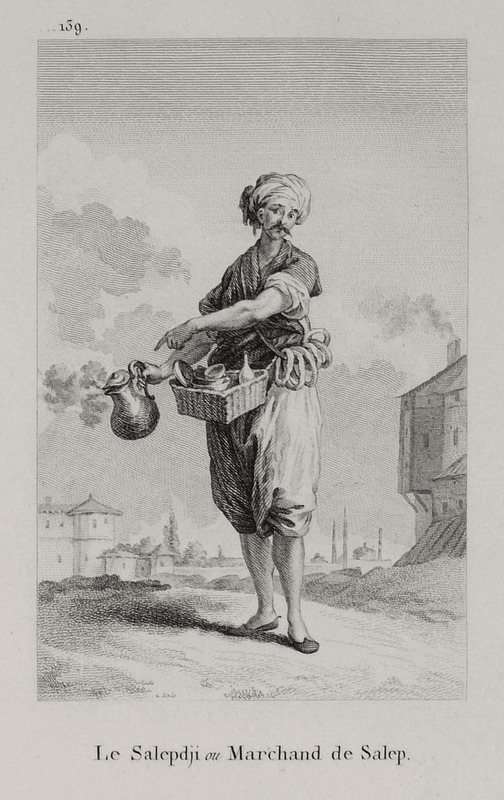 Sakkabaşı, head of water sellers. 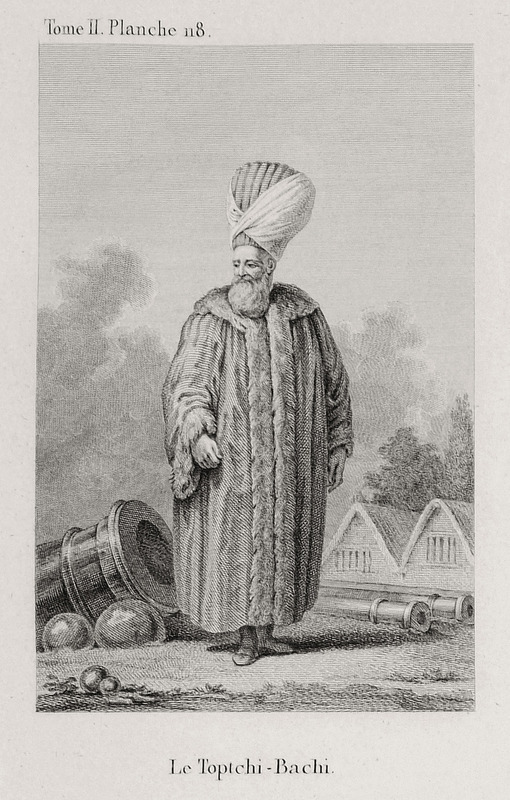 Topçu başı, head of the artillery. 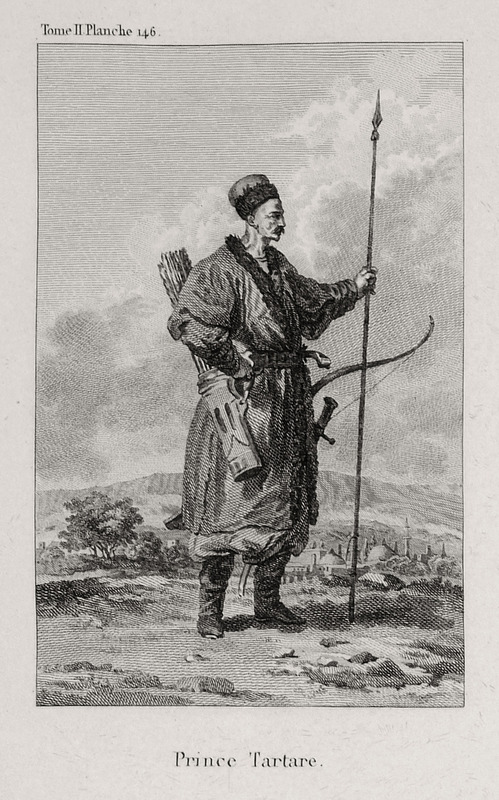 Kaseki, officer of the Bostancı unit. 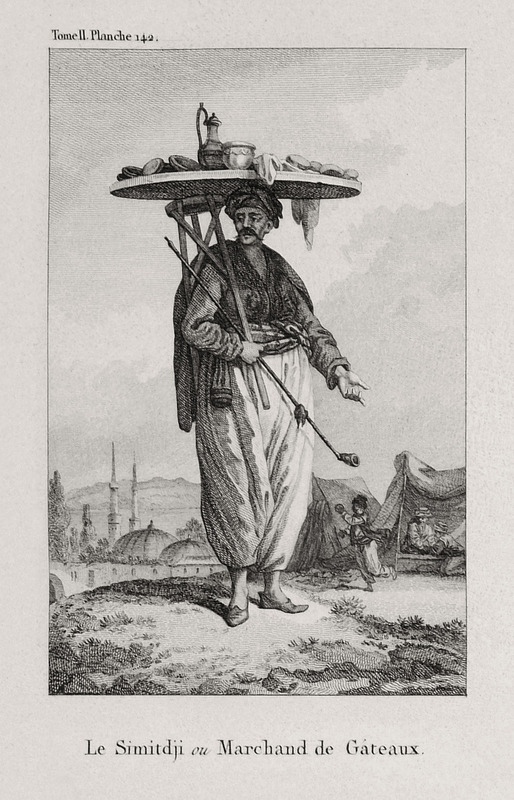 Humbaracı, soldier of the artillery. 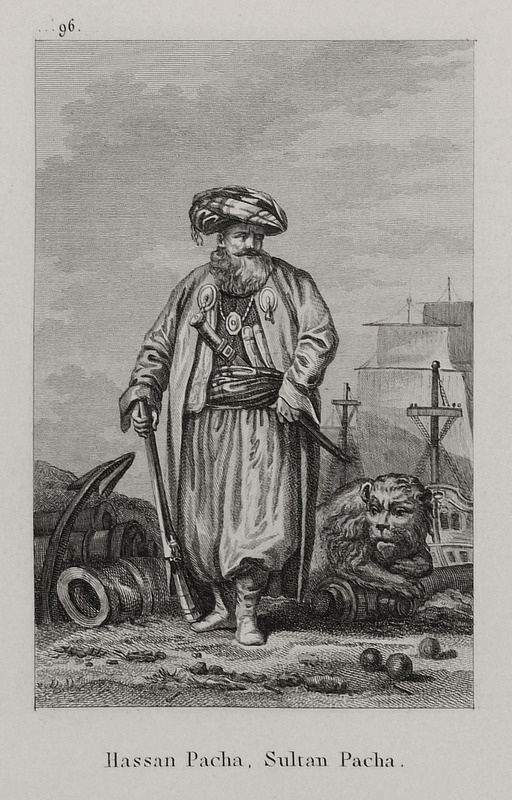 Reis, captain of a ship. 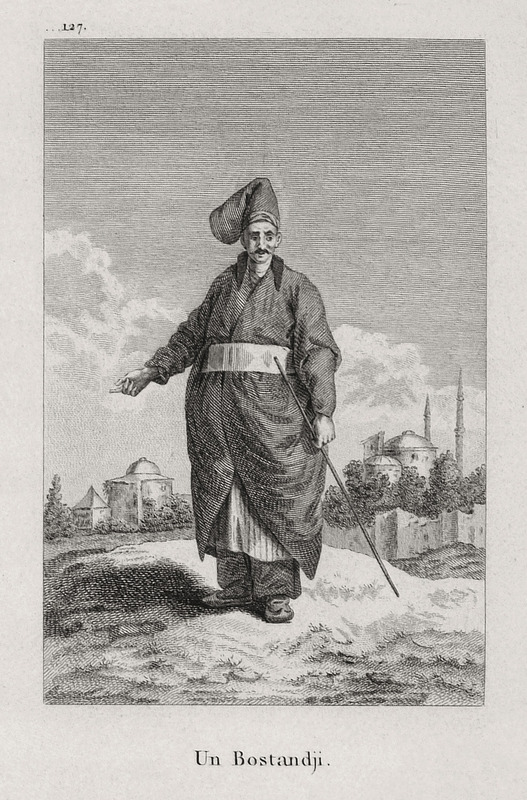 Aşçıbaşı, cook and officer of the Janissaries. 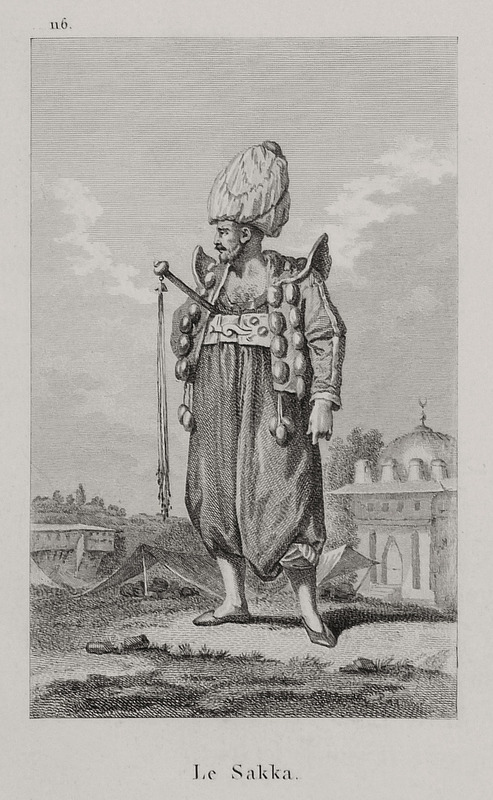 Bostancı, guardian of the Palace. 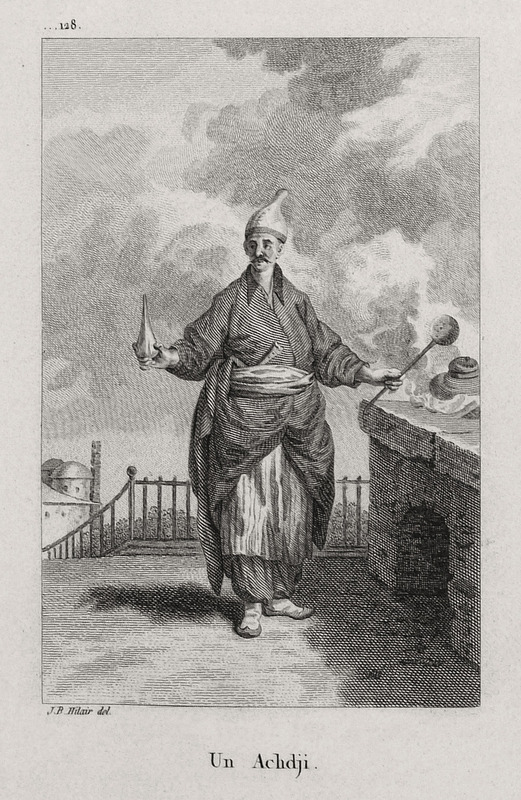 Aşçı, cook in the Sultan's palace. 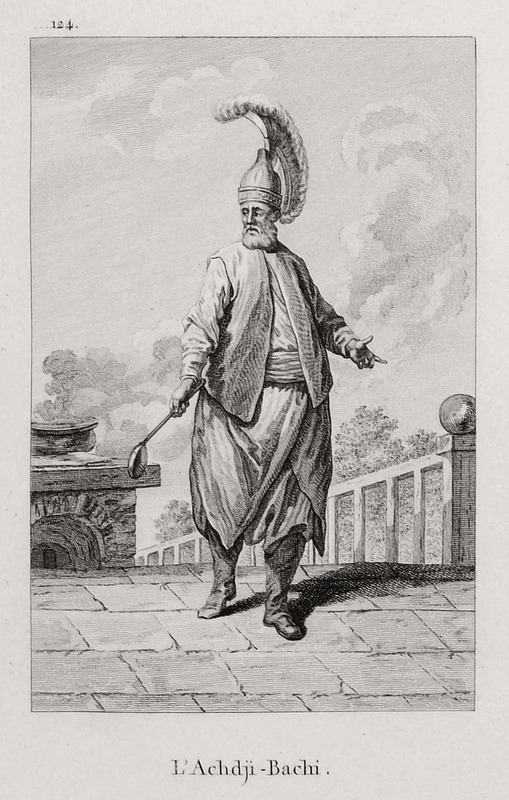 Helvacı, chief confectioner in the Sultan's palace. 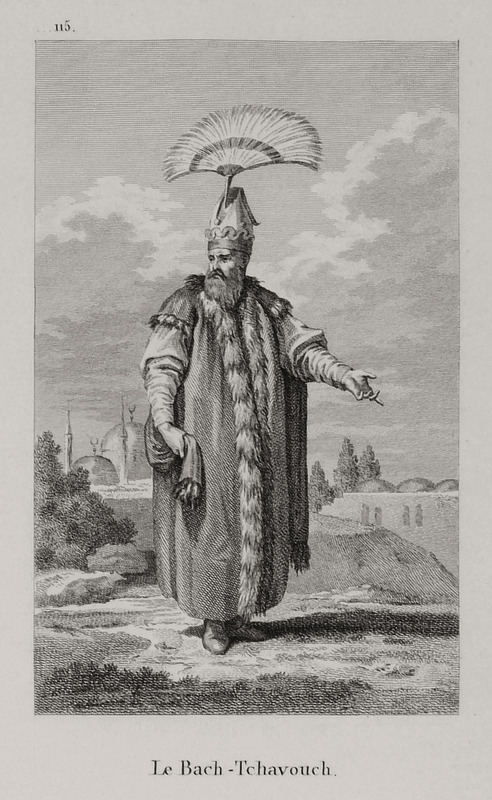 Nakibülesraf, the representative of the Sherif of Mecca at Istanbul. 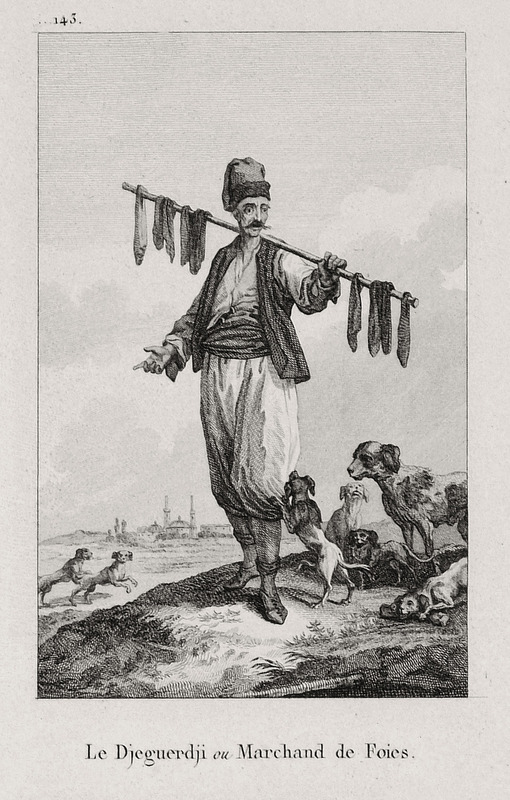 Simitçi, itinerant simit (bread) seller. 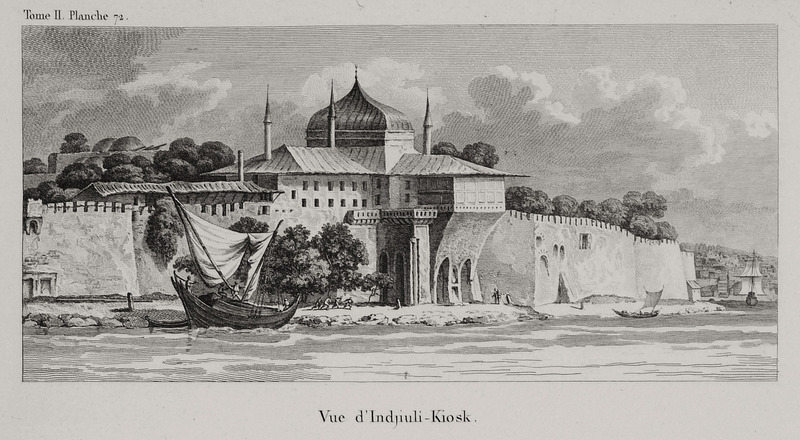 Sultan's kiosk at Defterdarburnu at Ortaköy, Istanbul. 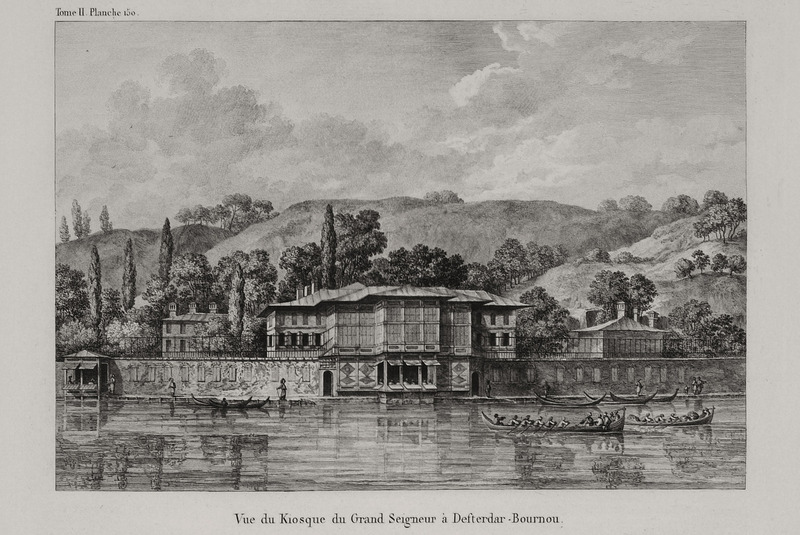 Ottoman residence somewhere in between Defterdarburnu and Kuruçeşme on the Bosporus, Istanbul. 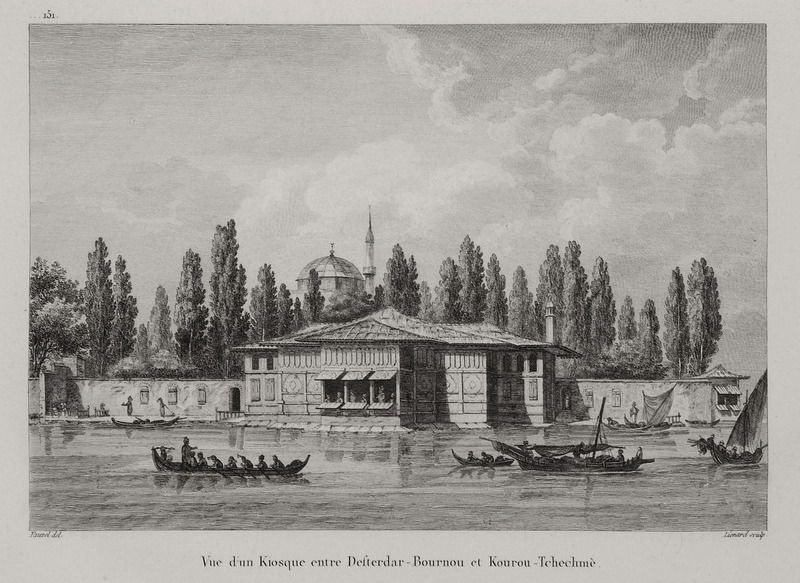 The residence of Bostancıbaşı, head gardener and executioner, at Kuruçeşme. 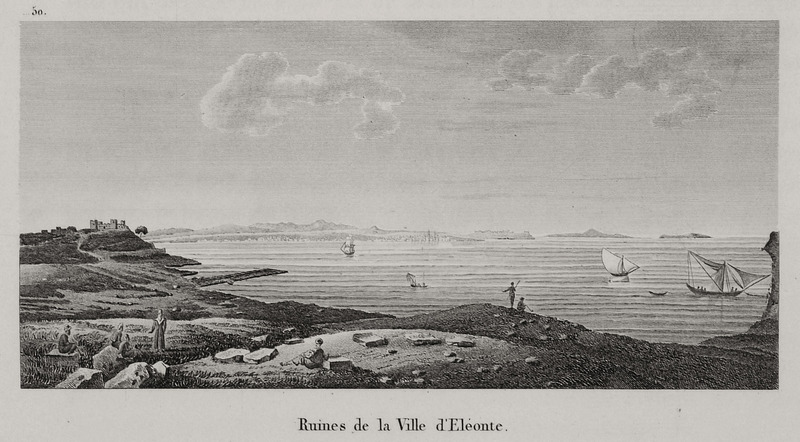 View of the Rumelian and Anatolian Castles on the Bosporus, Istanbul. 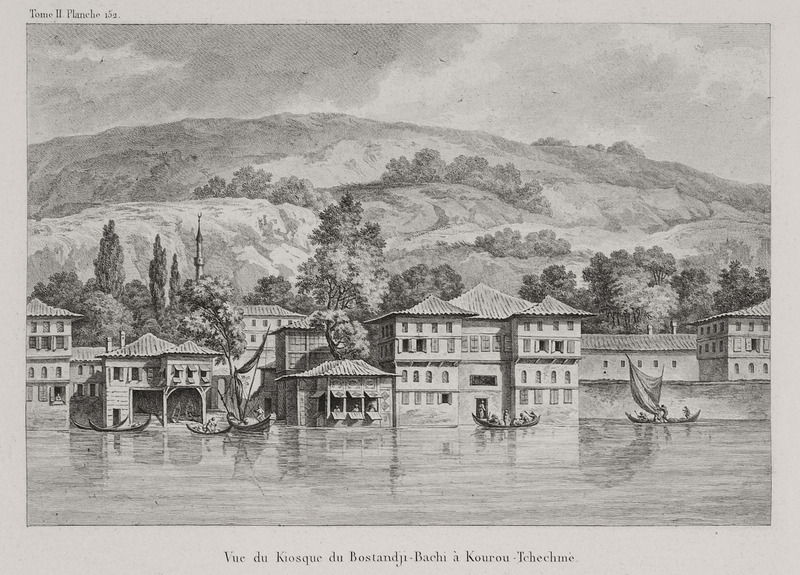 View of Büyükdere on the European shores of the Bosporus, Istanbul. 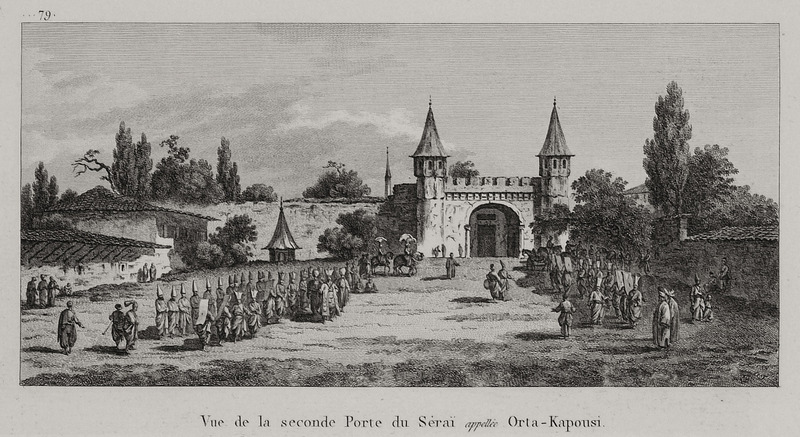 The fortresses at the entrance to the Black Sea. 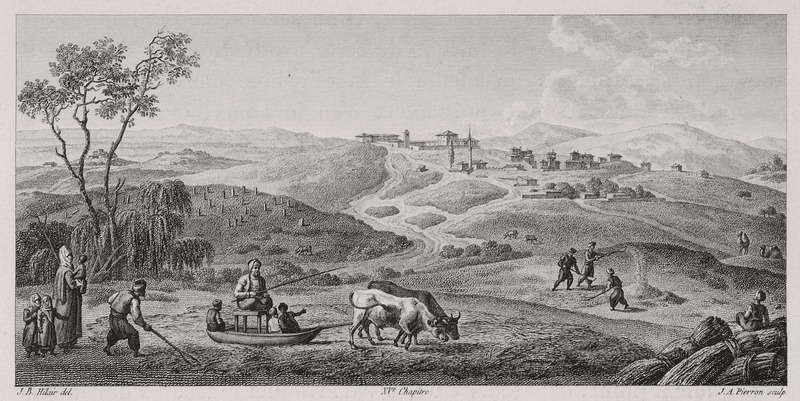 View of the prairies of Büyükdere. 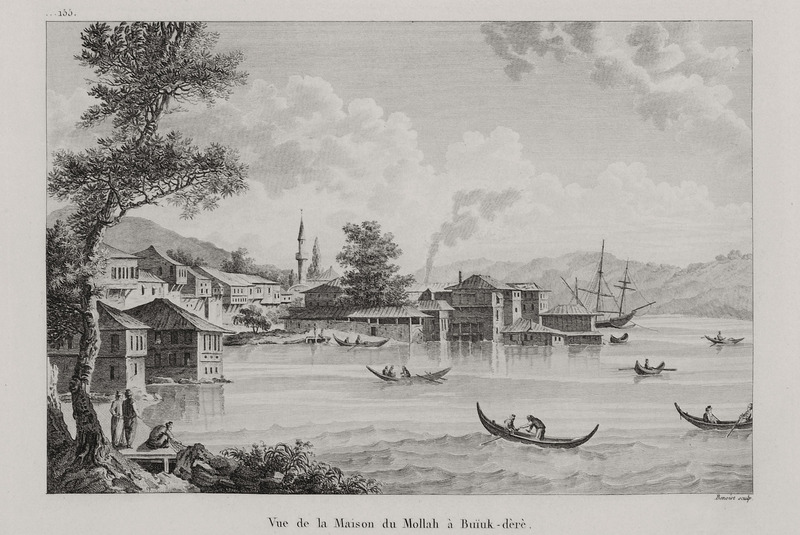 Mullah's residence at Büyükdere, on the European shores of the Bosporus, Istanbul.